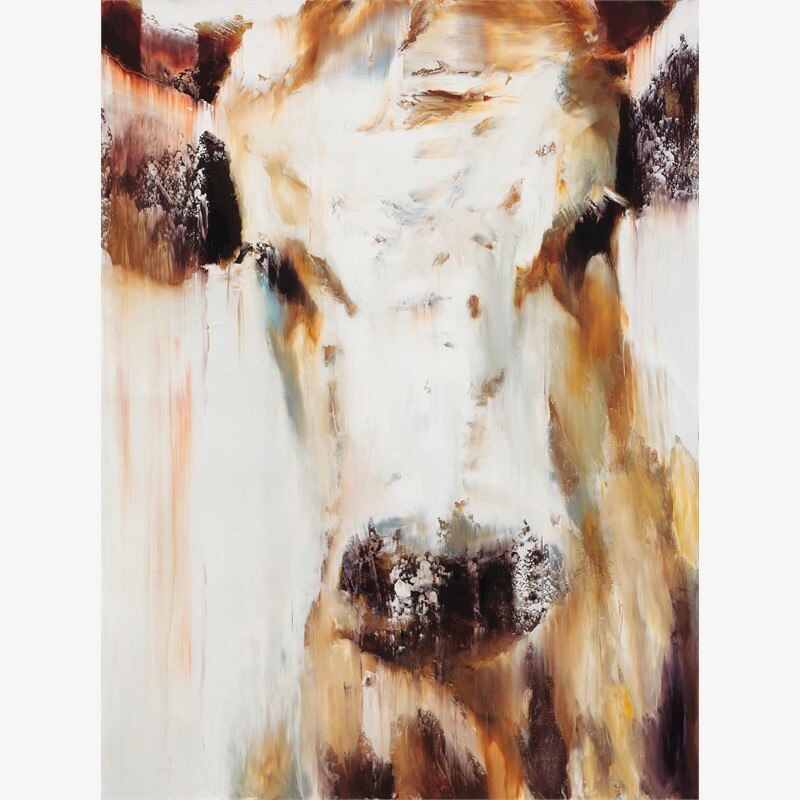 Elsa is a Colorado native from a family of six siblings, all of whom share the love of art and design. 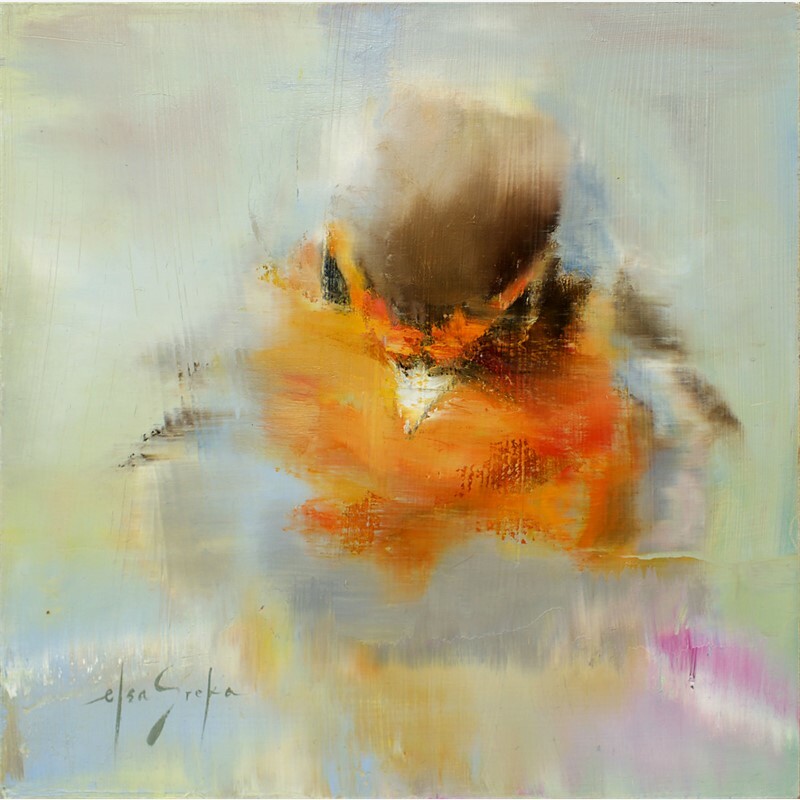 Mostly self taught, Elsa’s work is based on instinct rather than theory. 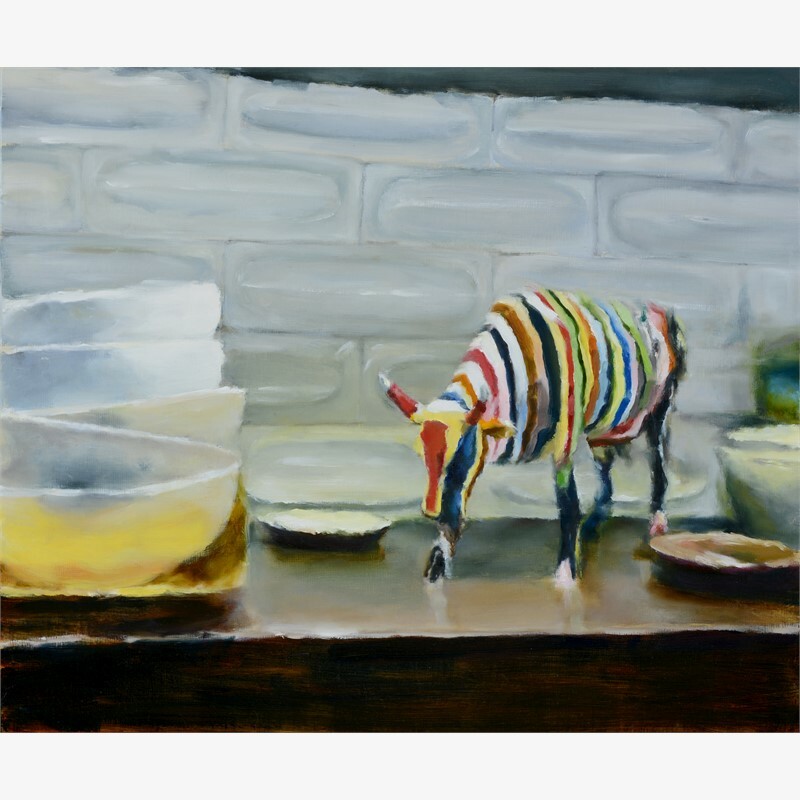 Her inspiration can be selective as when drawn from early childhood memories; particularly hours spent drawing at the kitchen table with her brothers and sisters overseen by their father. 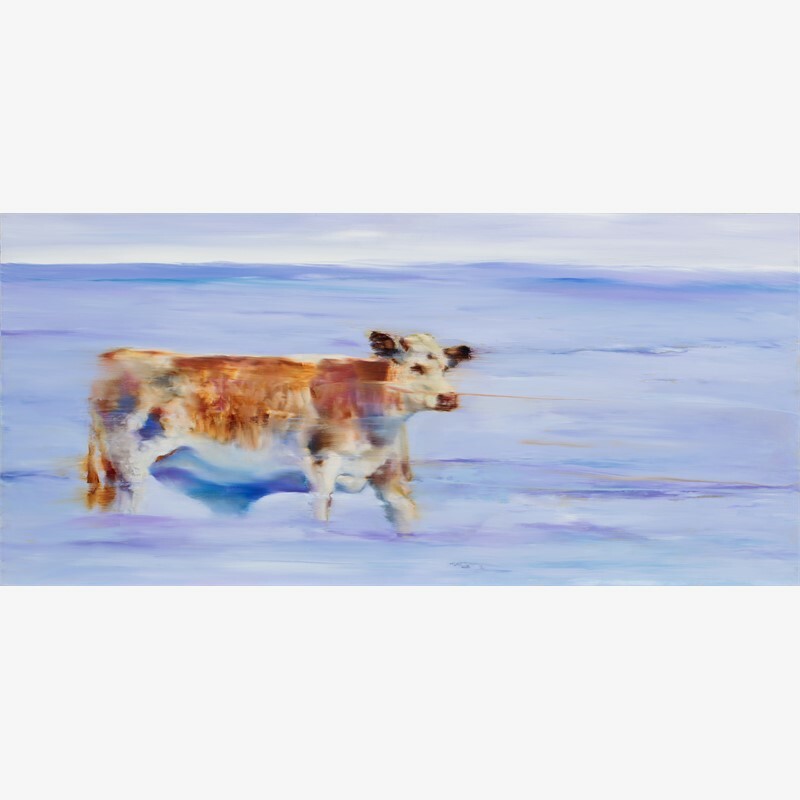 Her inspiration can also randomly unfold as she approaches a blank canvas with no preconceived ideas, not knowing where it will end up. 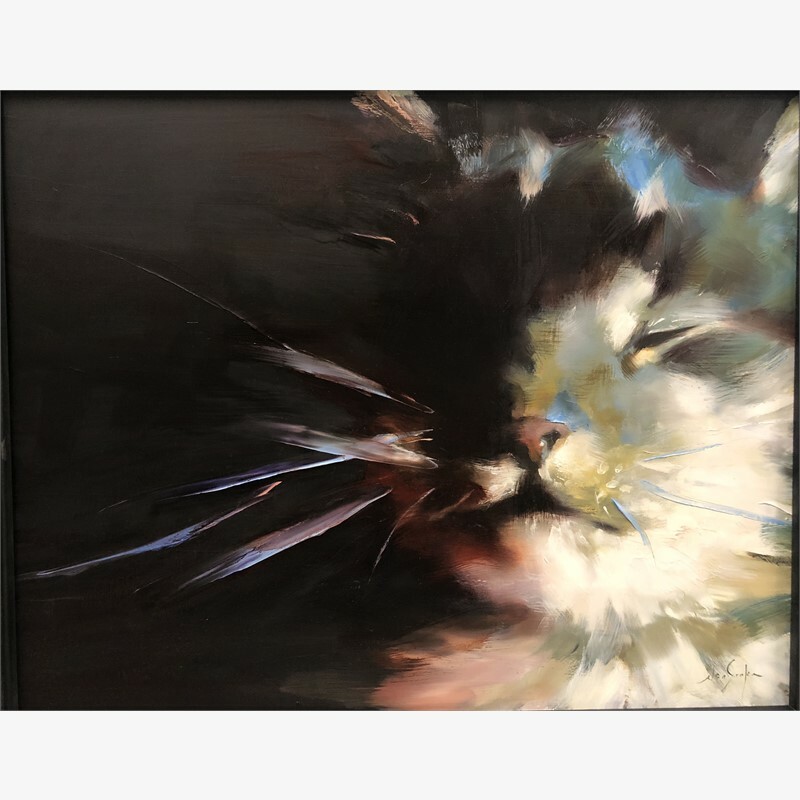 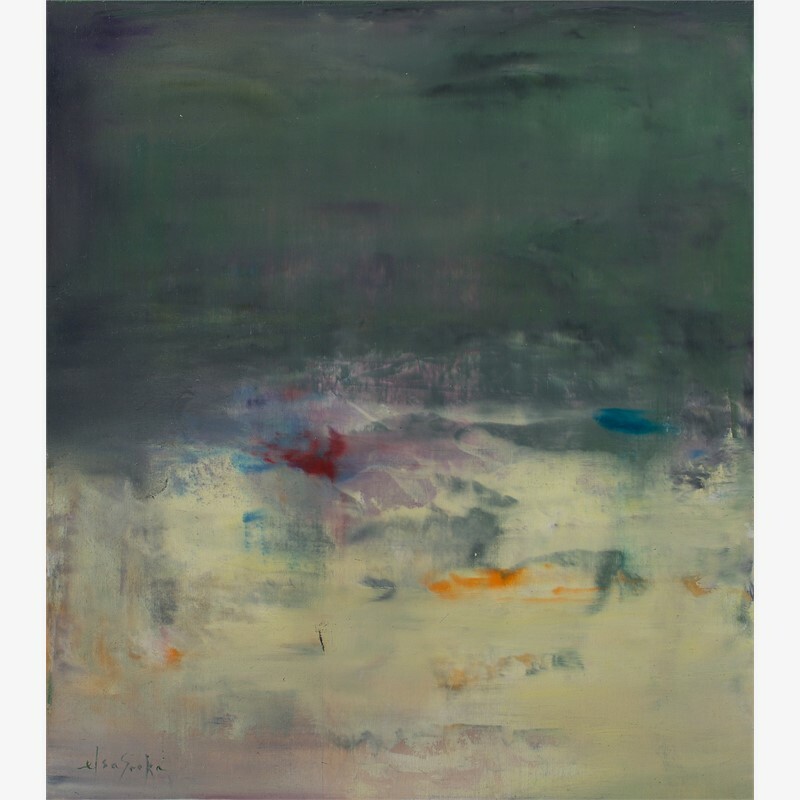 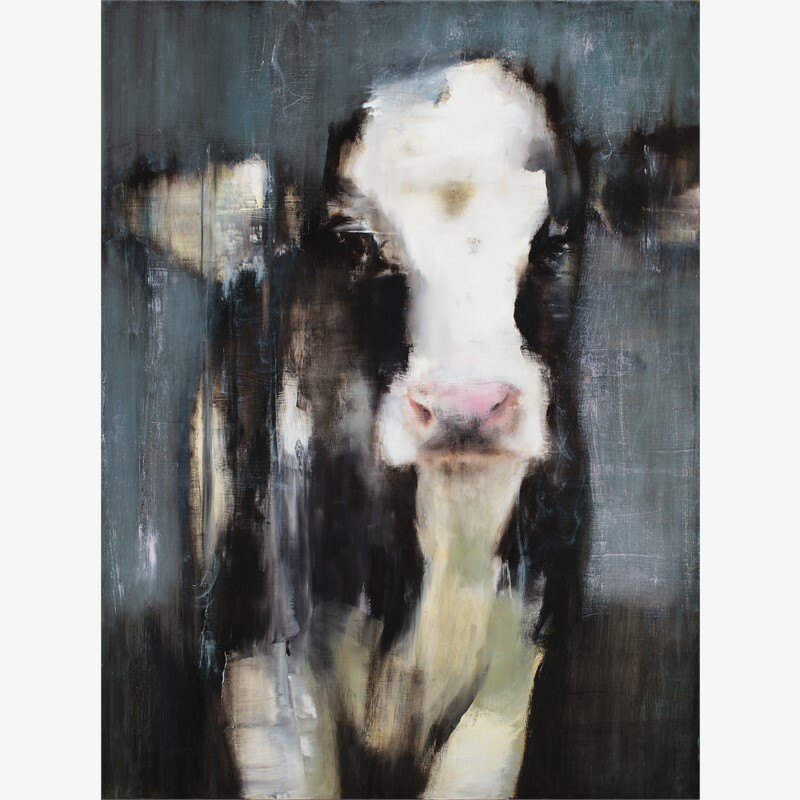 Often the subjects of her paintings are secondary to what may emerge from both unintentional marks and intentional smears that ignite a series of chain reactions suggesting a direction and ultimately meaning. 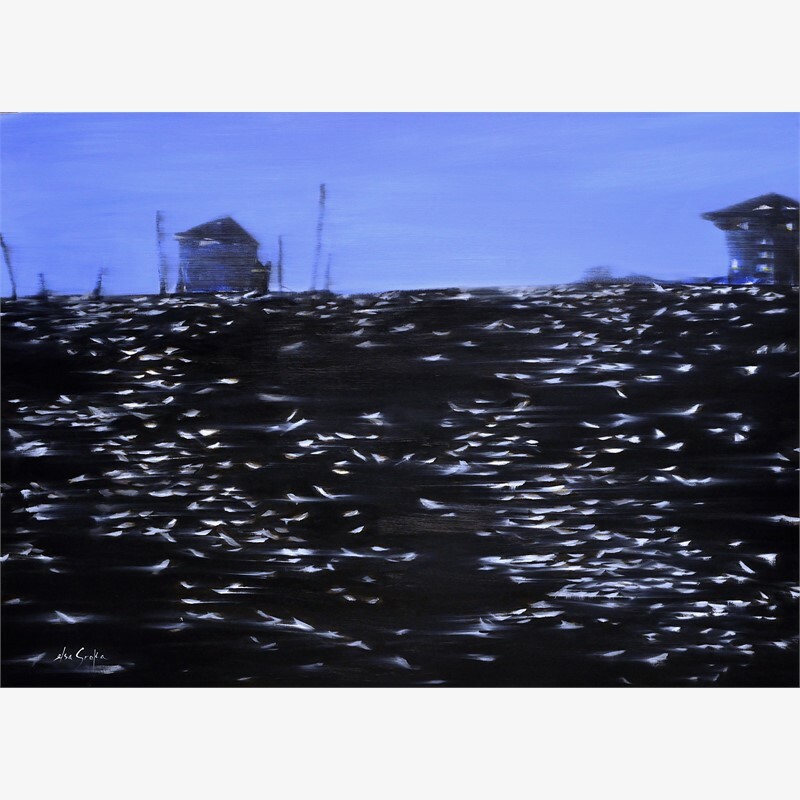 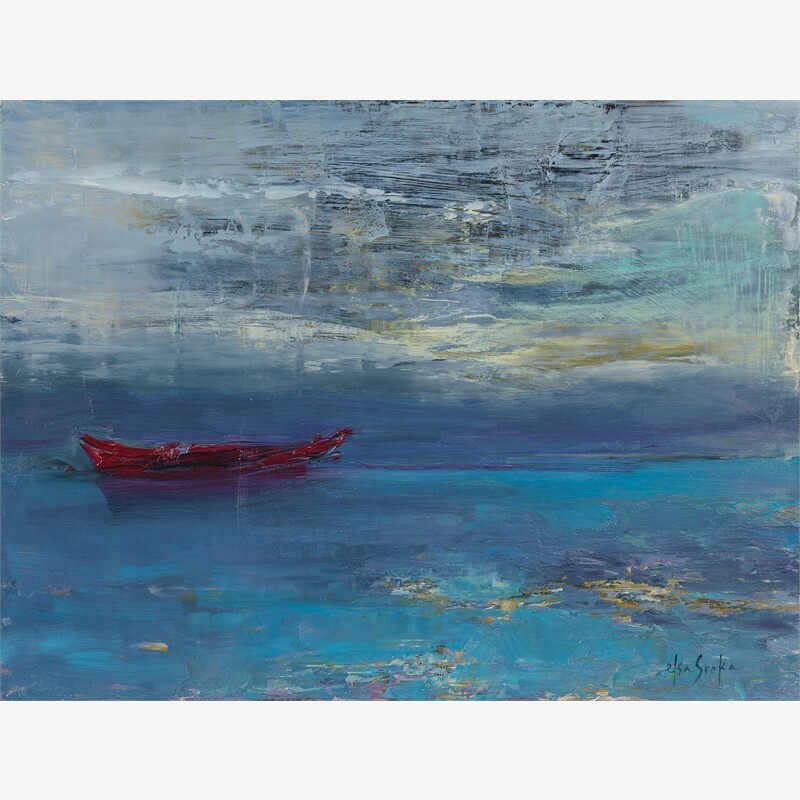 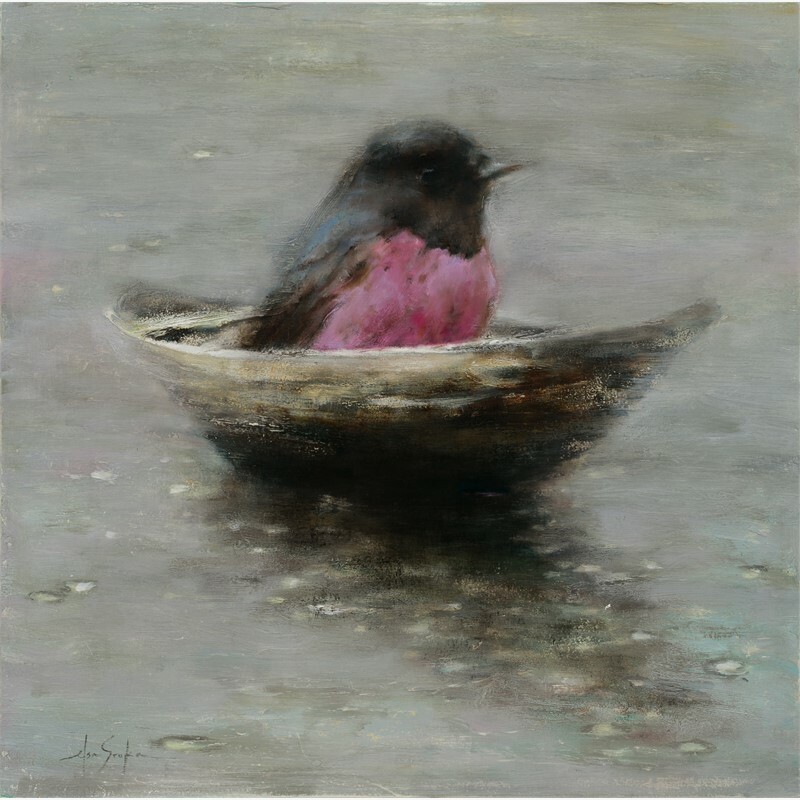 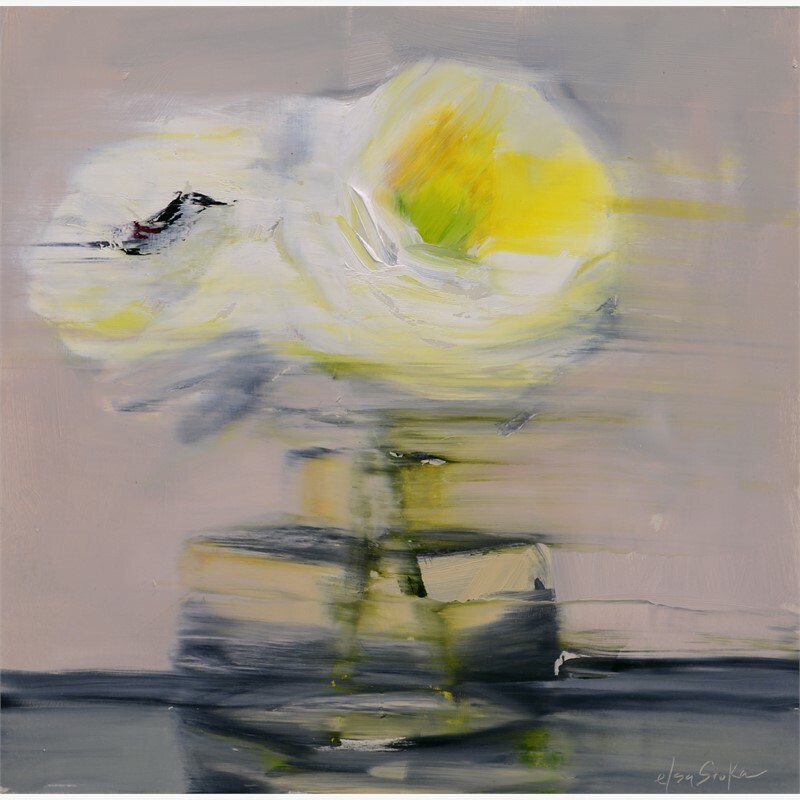 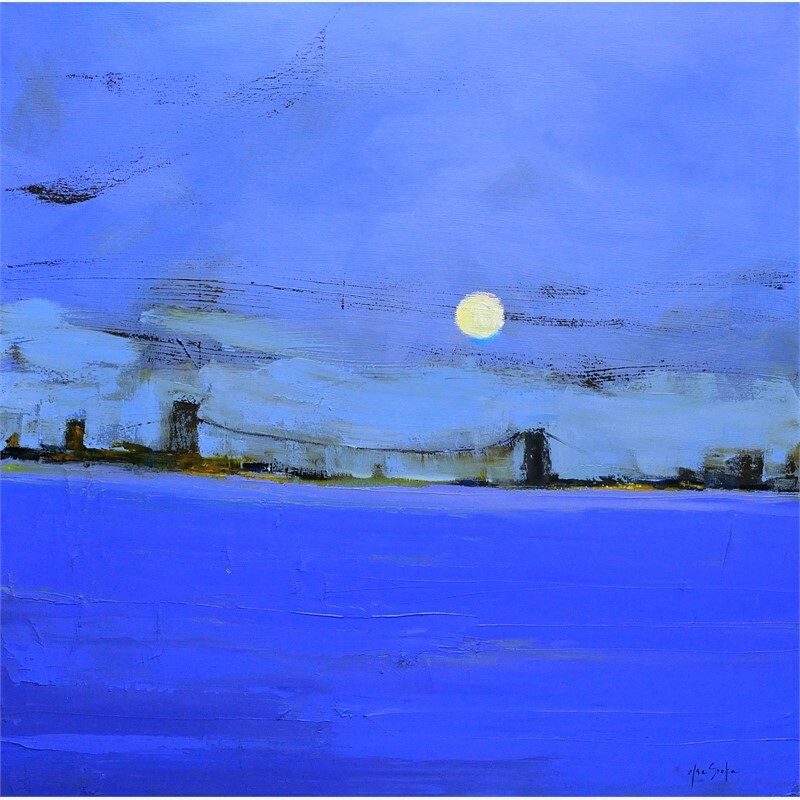 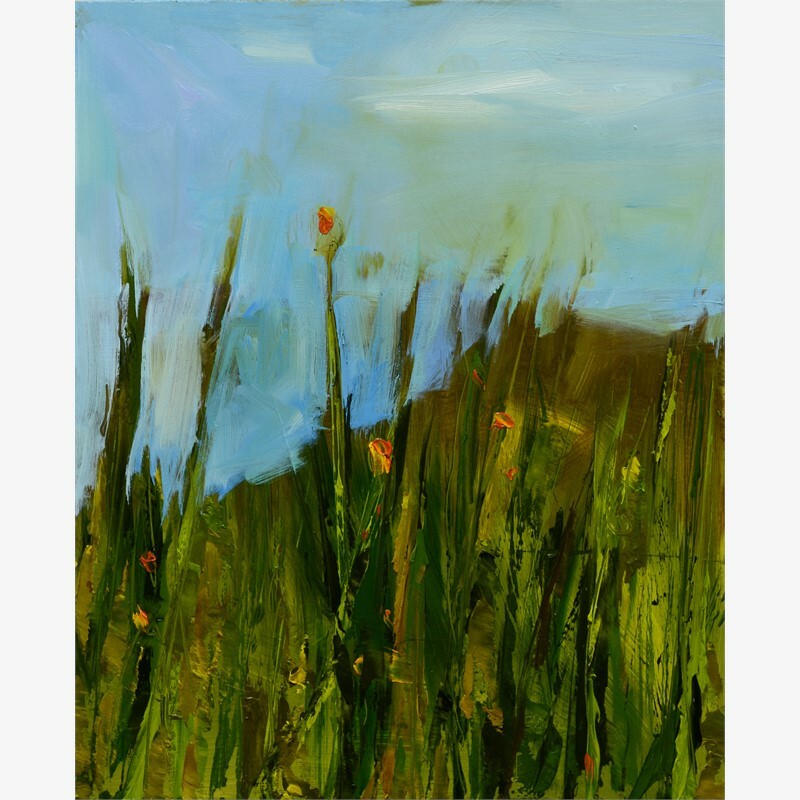 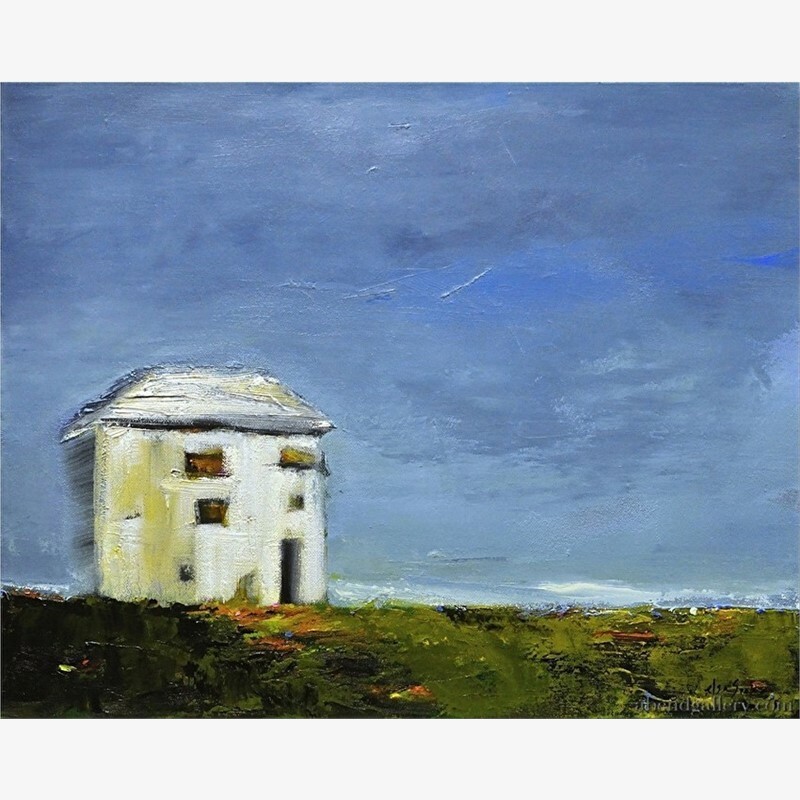 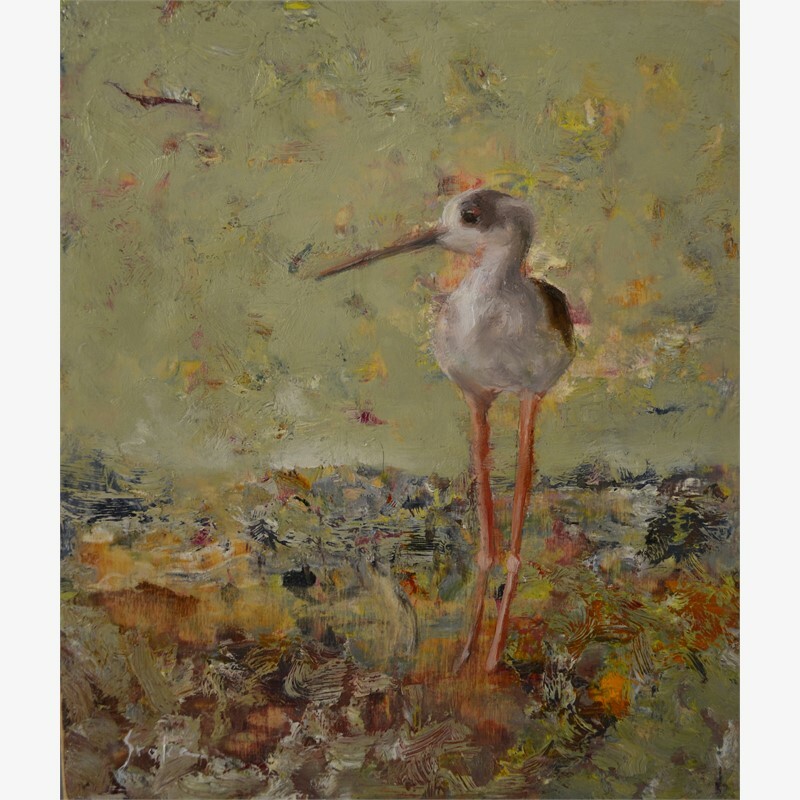 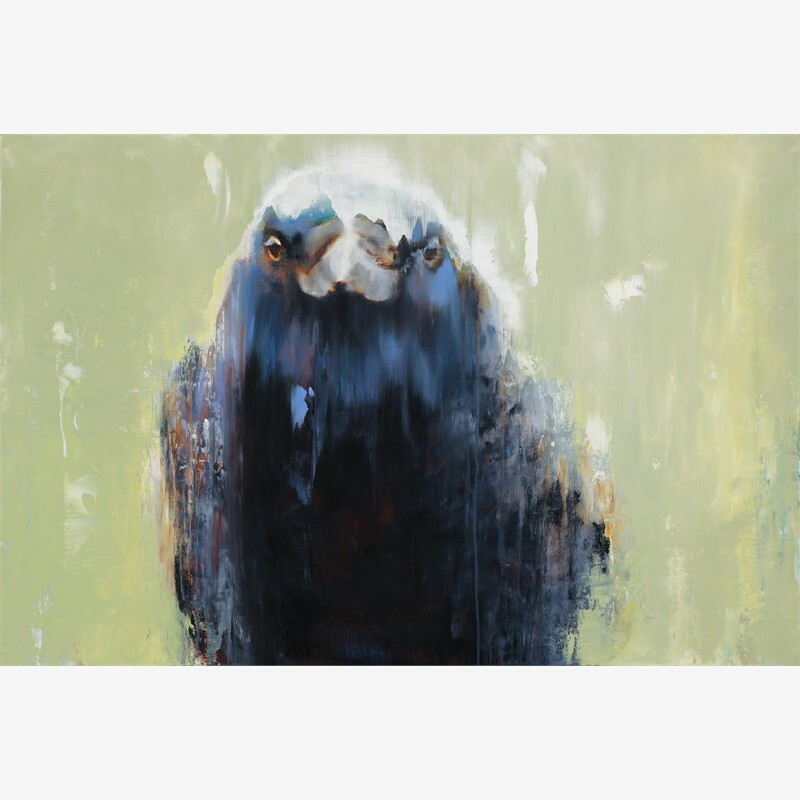 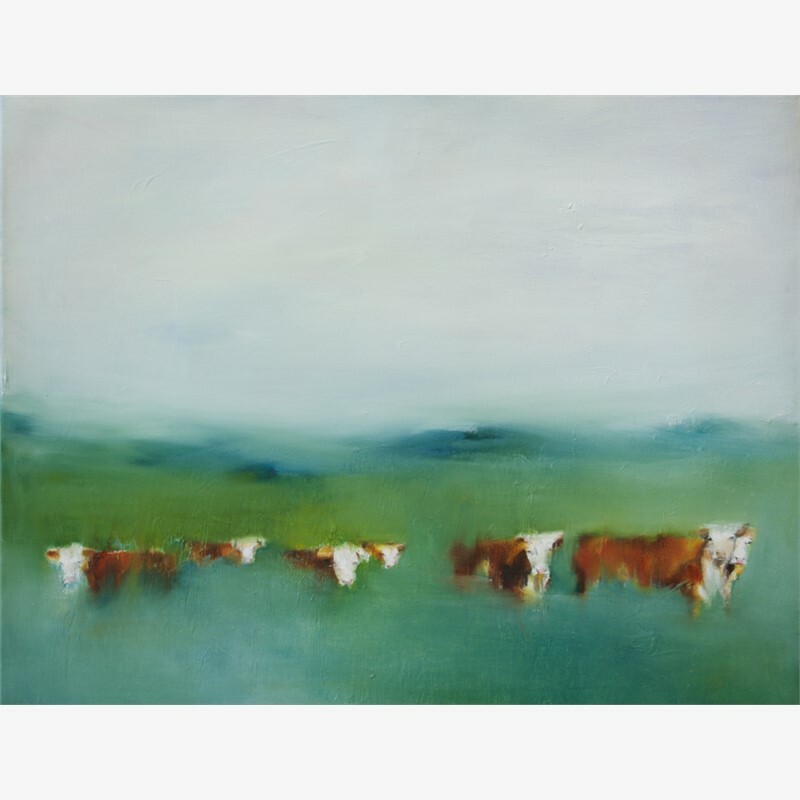 While Elsa paints a variety of subjects, all exude a forward-thinking, contemporary attitude. 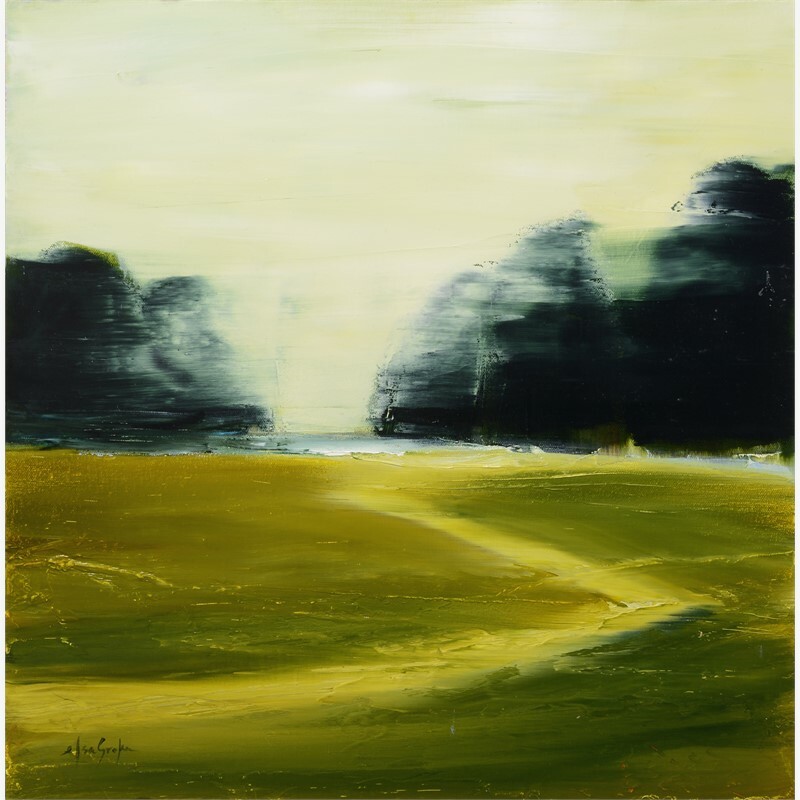 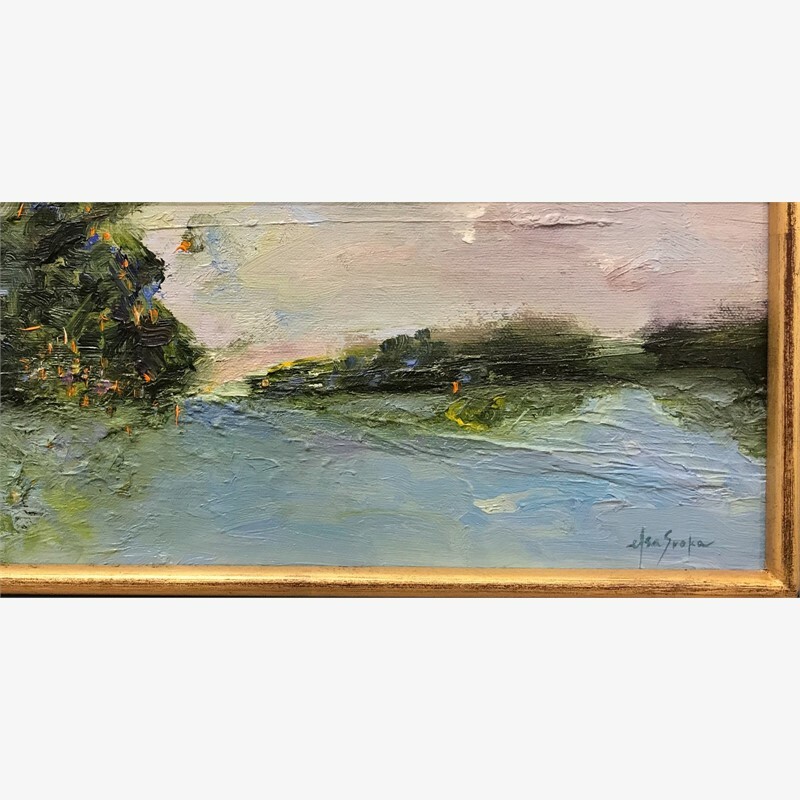 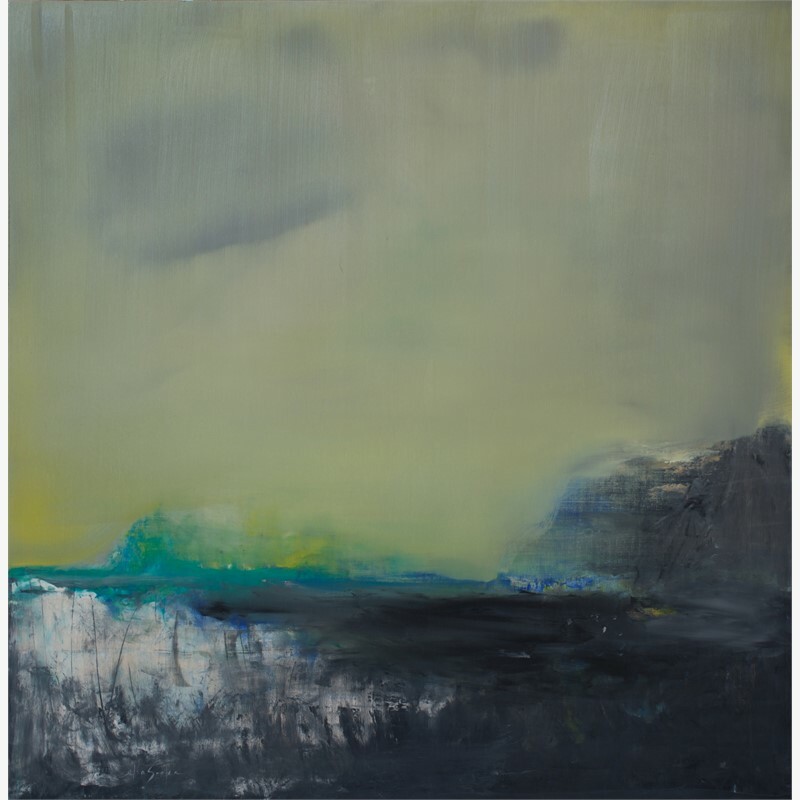 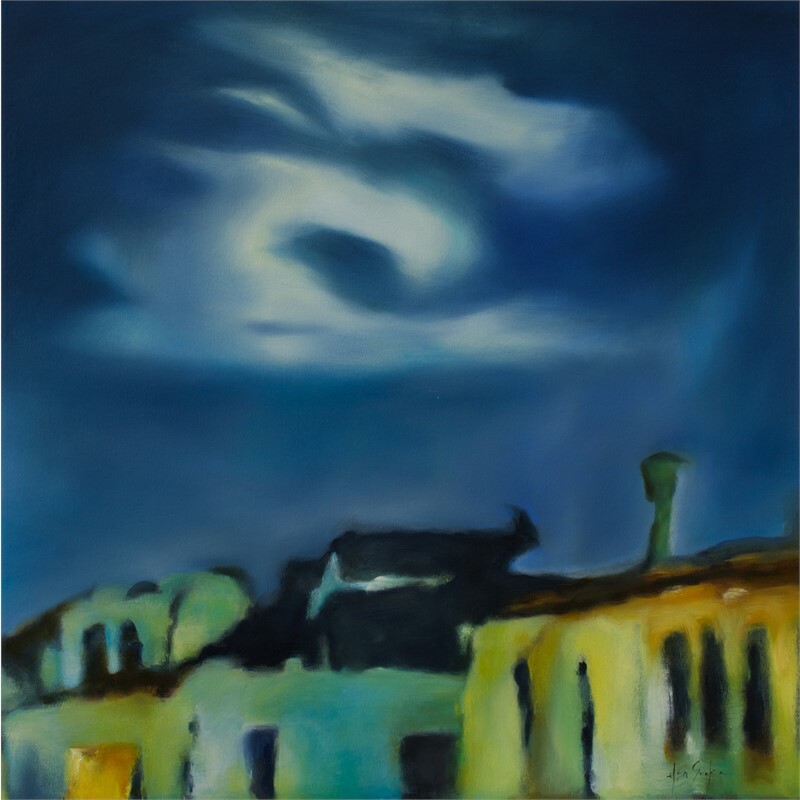 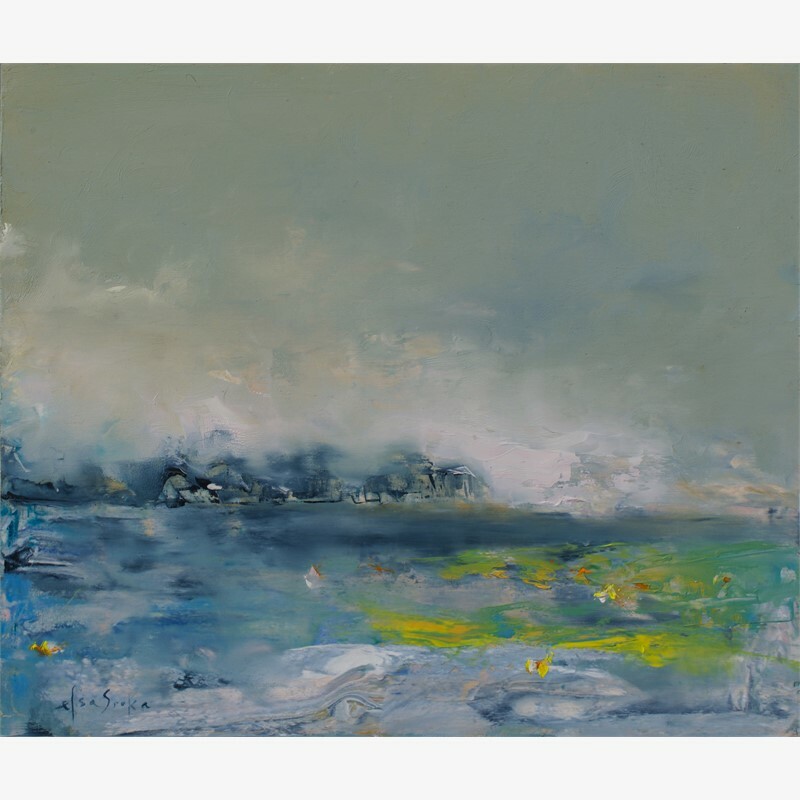 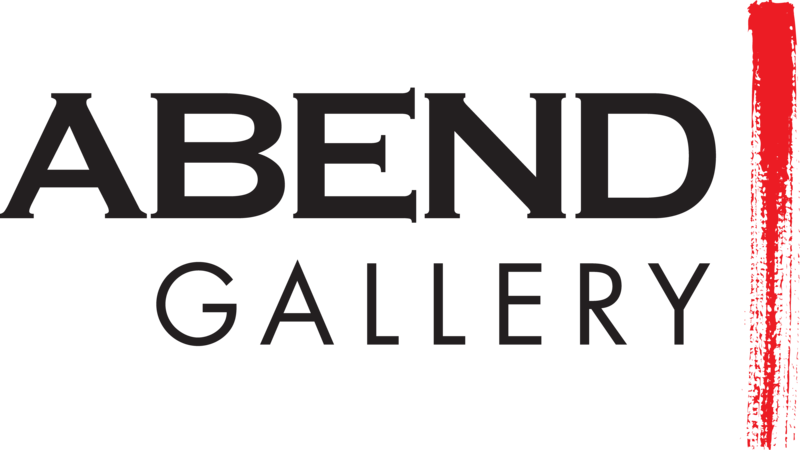 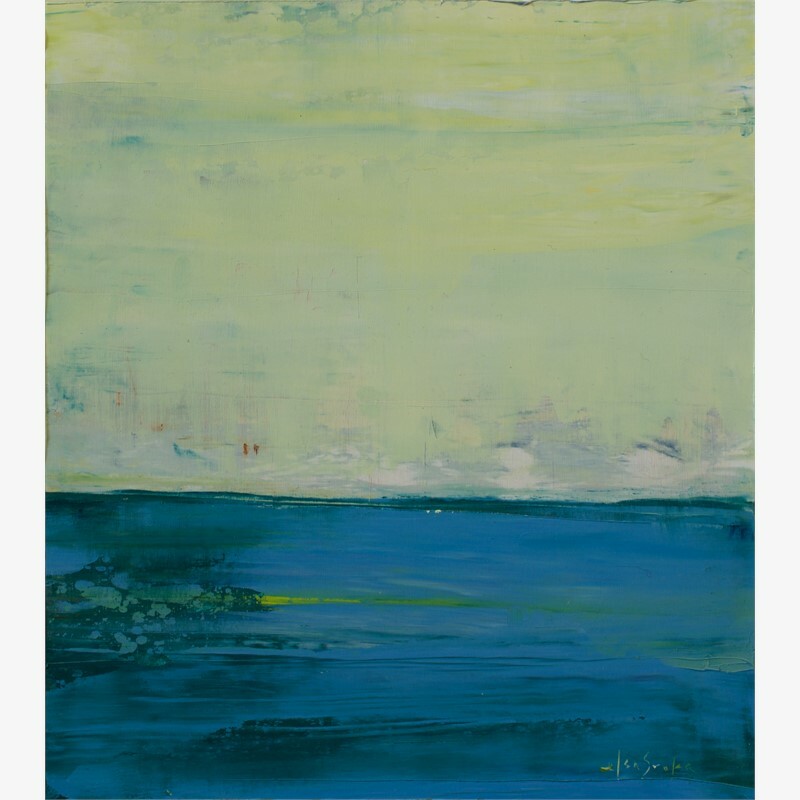 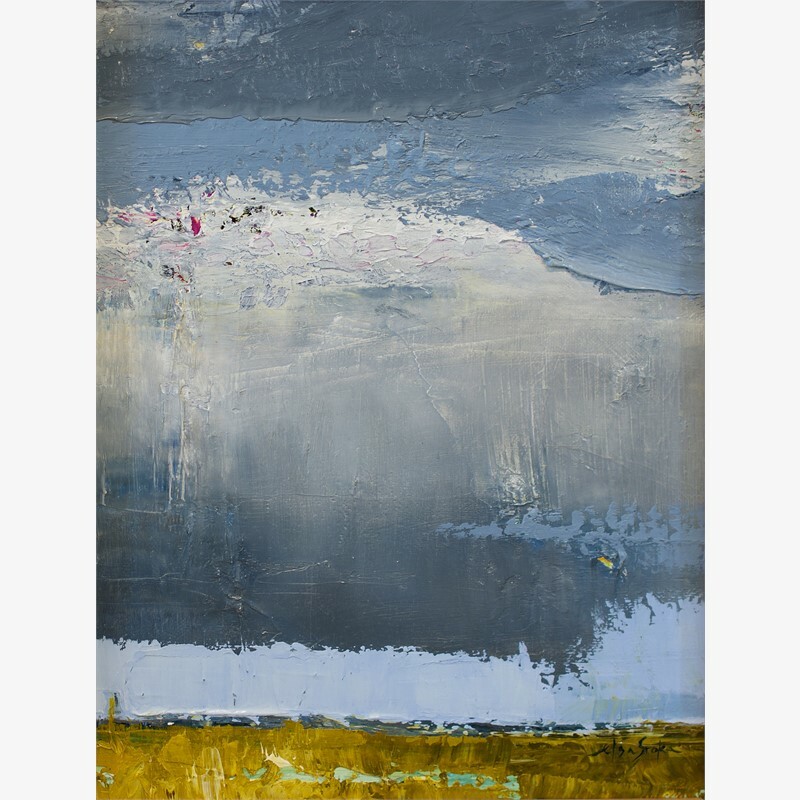 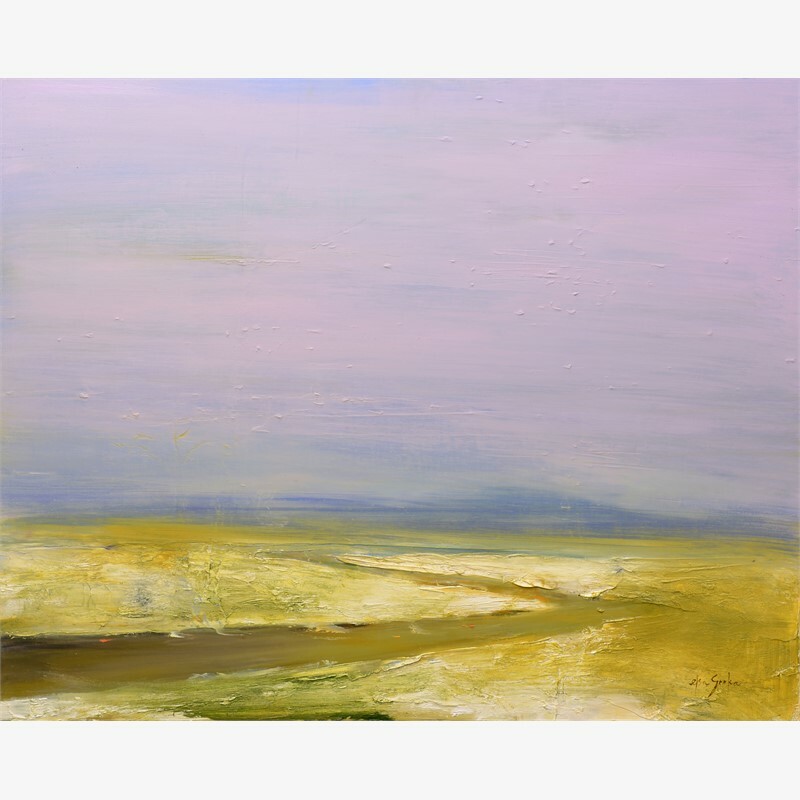 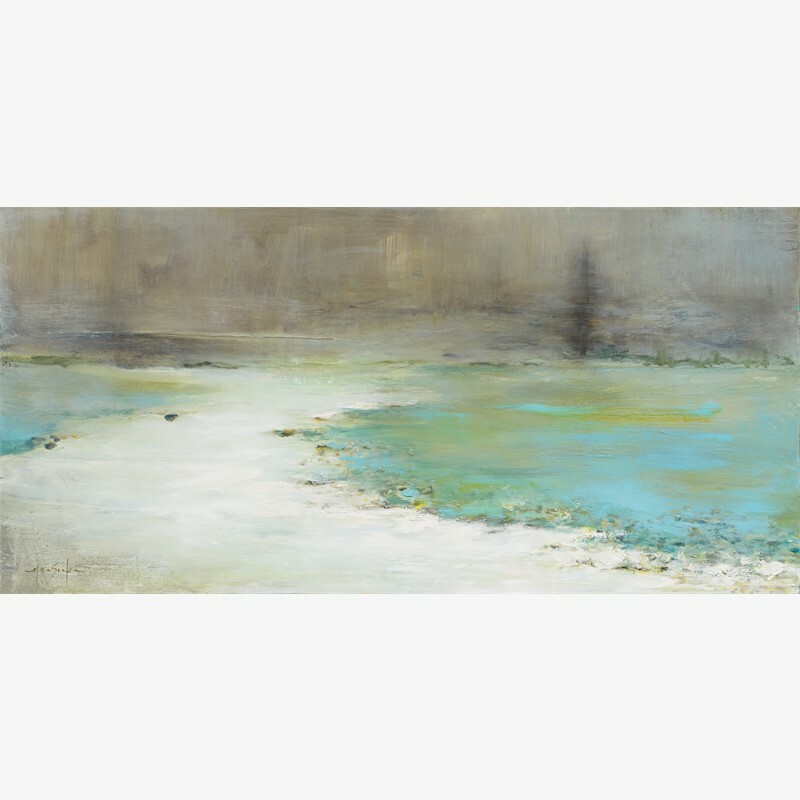 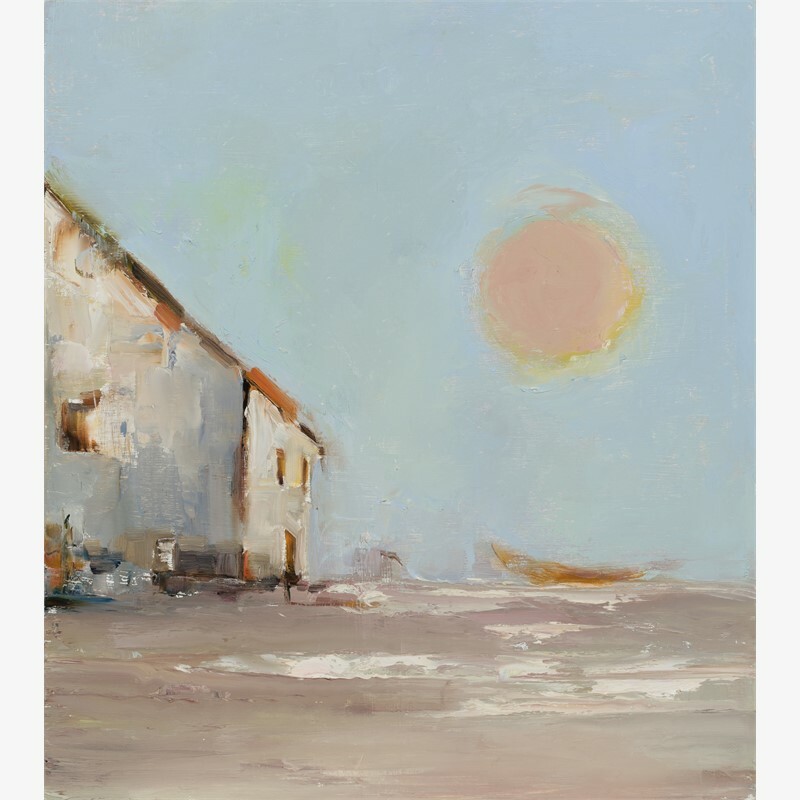 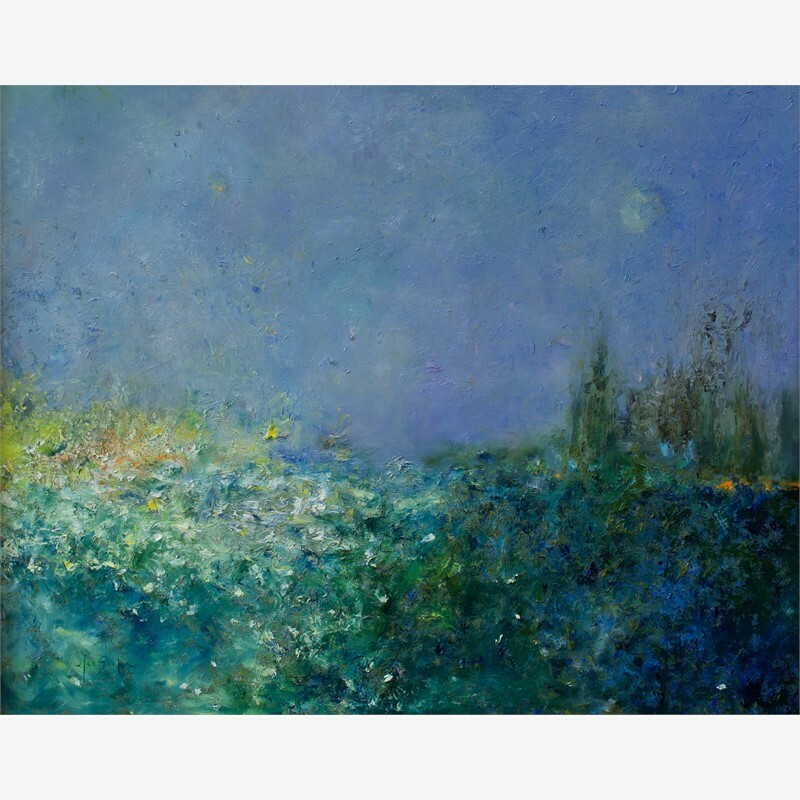 Her landscapes are mostly color-driven, finding inspiration in many sources including the various landscapes discovered in her travels, elements found in architecture, the imagery of other artists, and her own imagination. 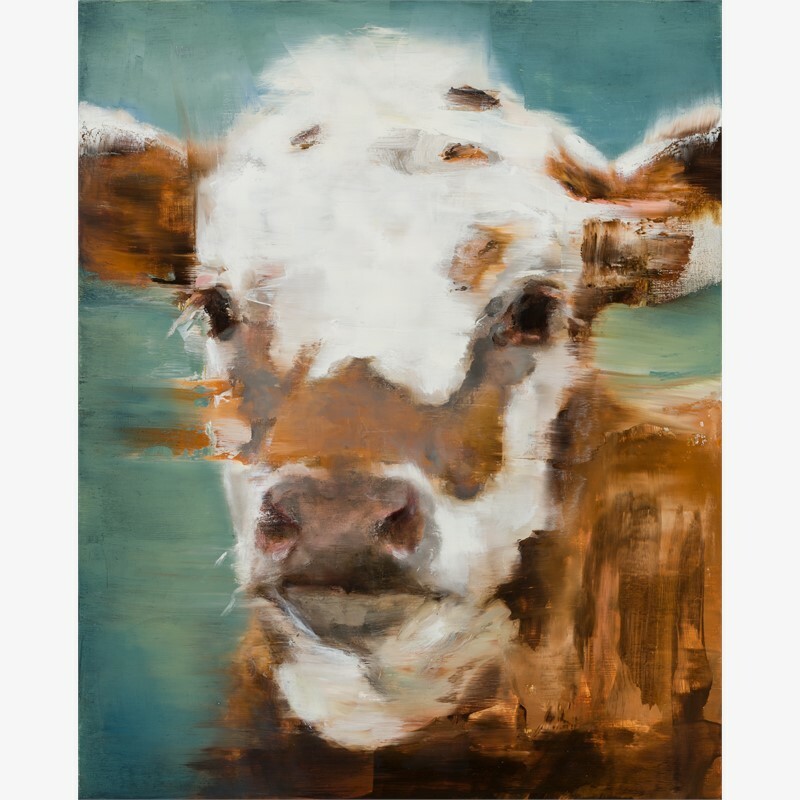 After laying down her foundational colors she scrapes away and moves the paint to reveal what is underneath, then applies more layers of paint. 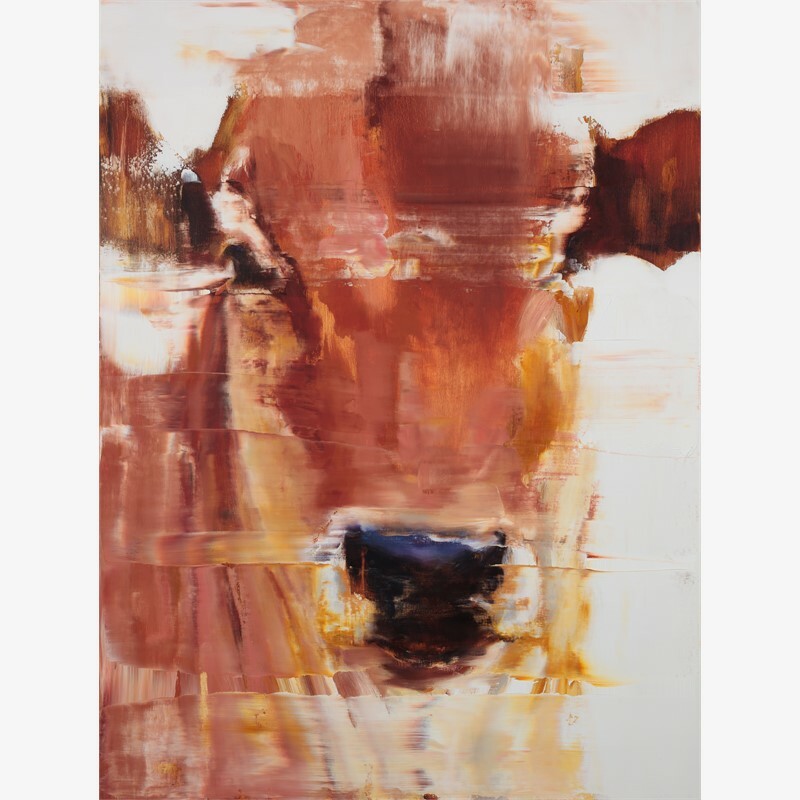 It’s not unusual for her to destroy a large portion of the piece in progress, ultimately resurrecting it through layer after layer, creating meaning and form in the process. 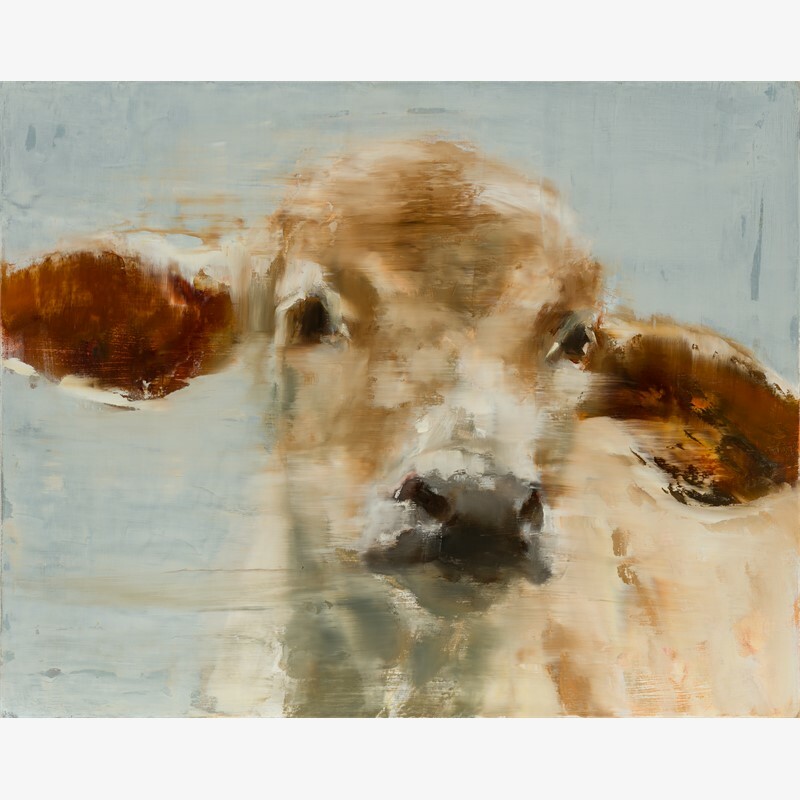 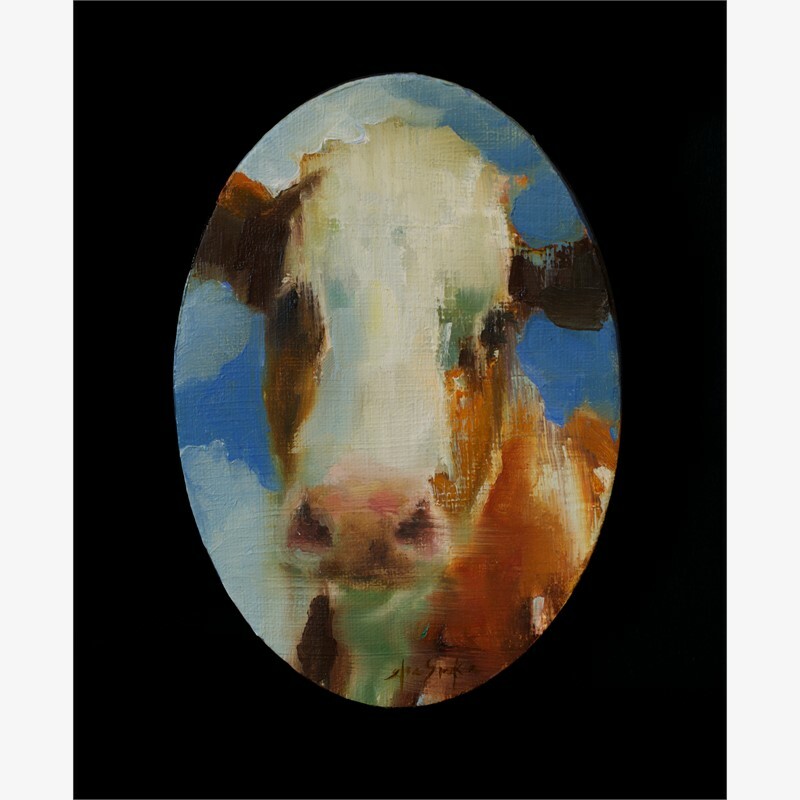 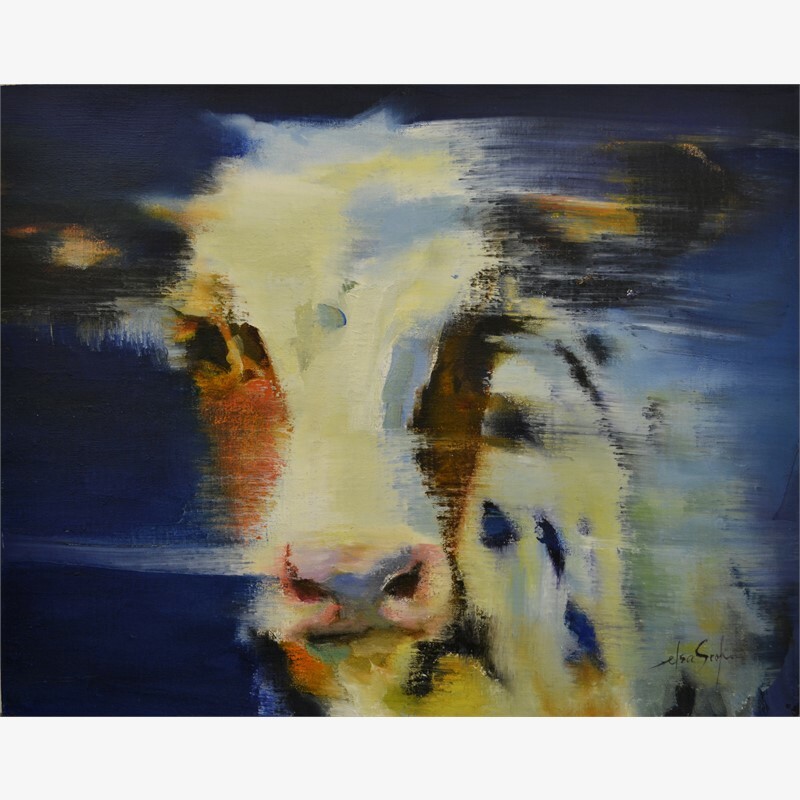 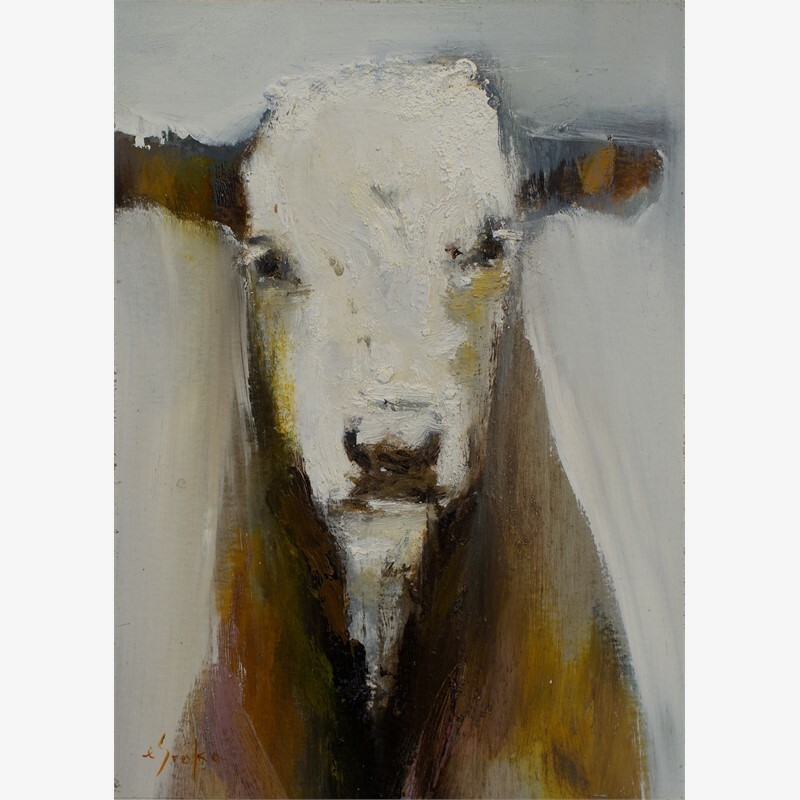 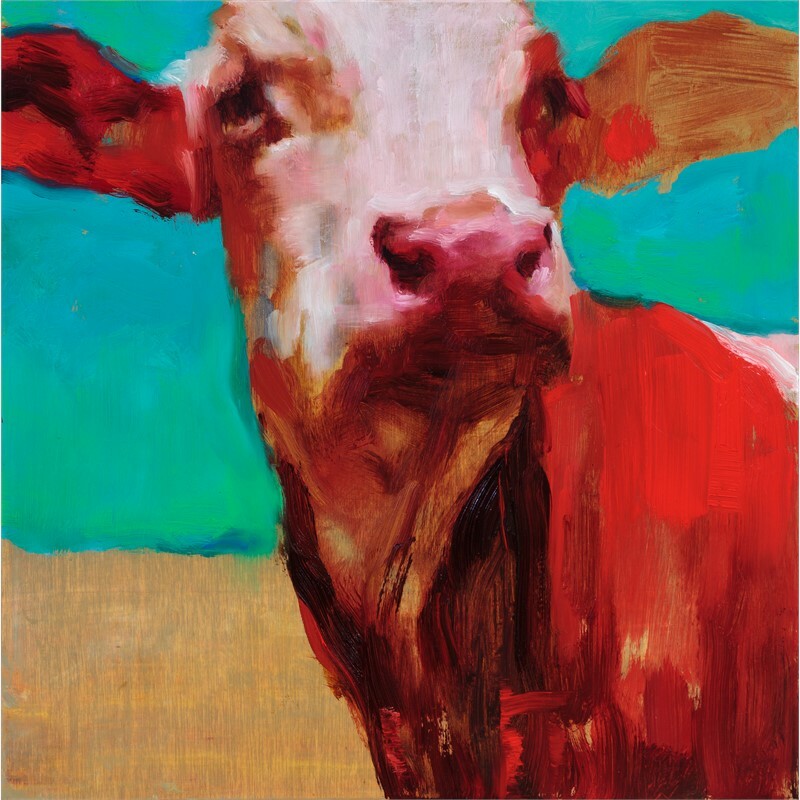 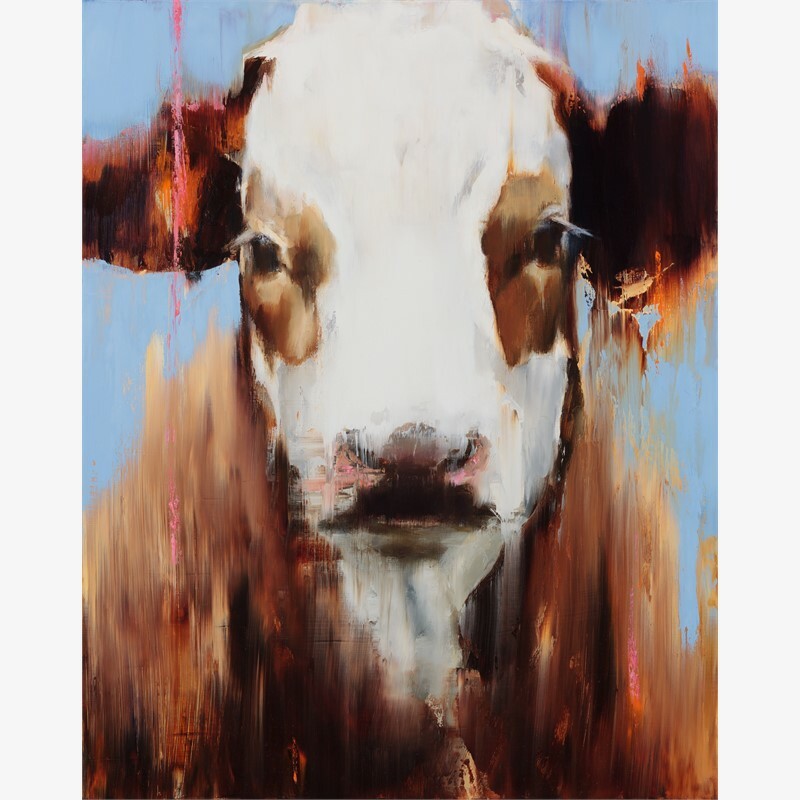 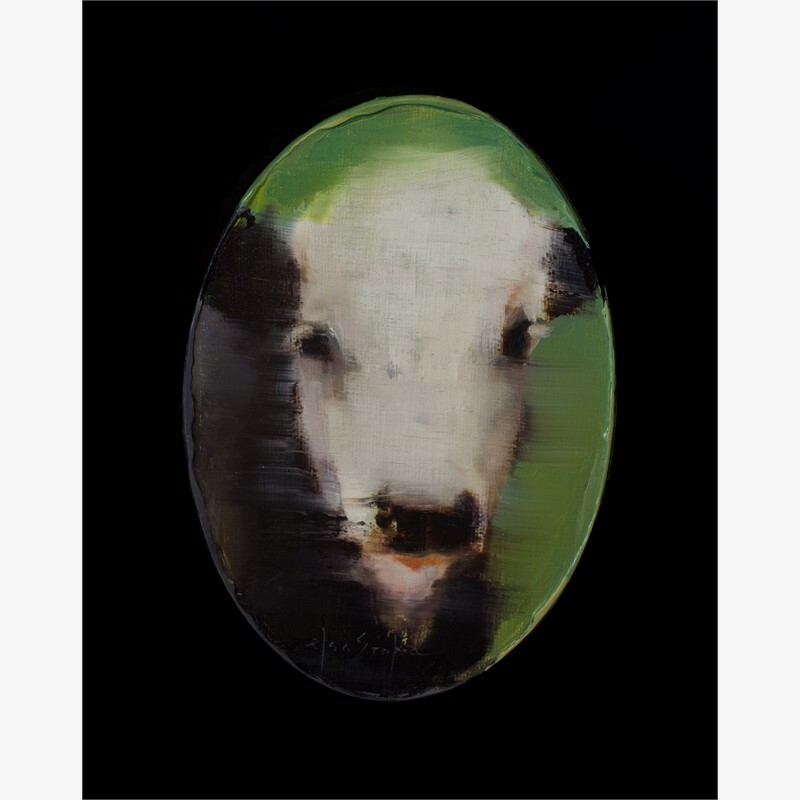 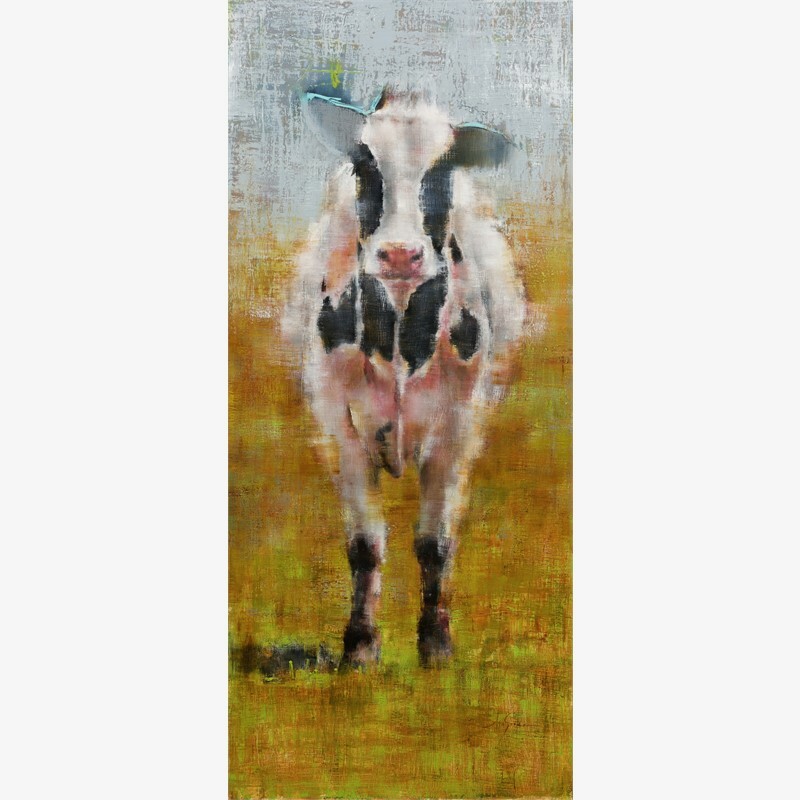 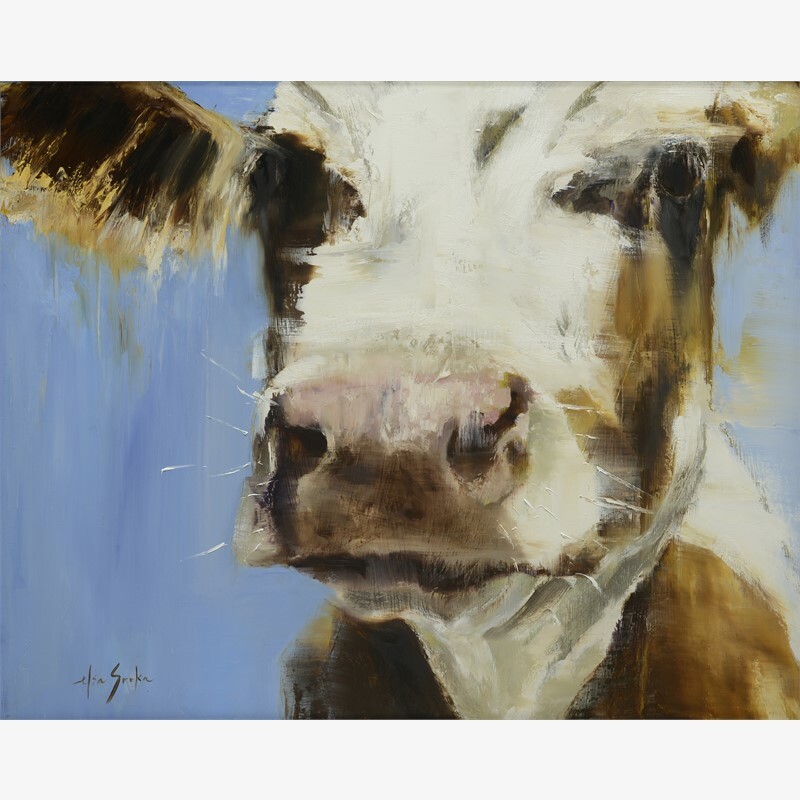 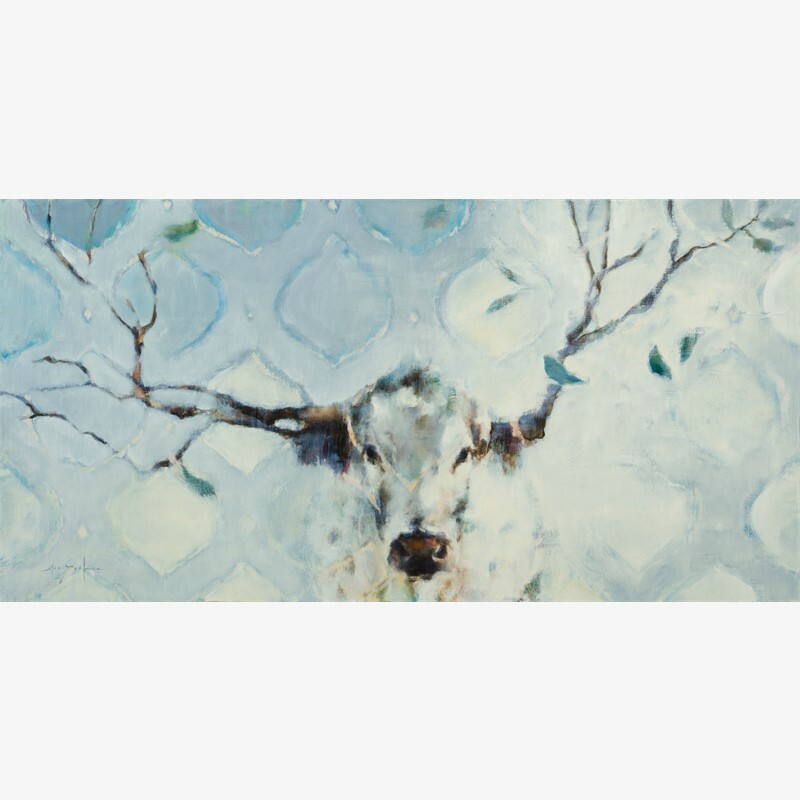 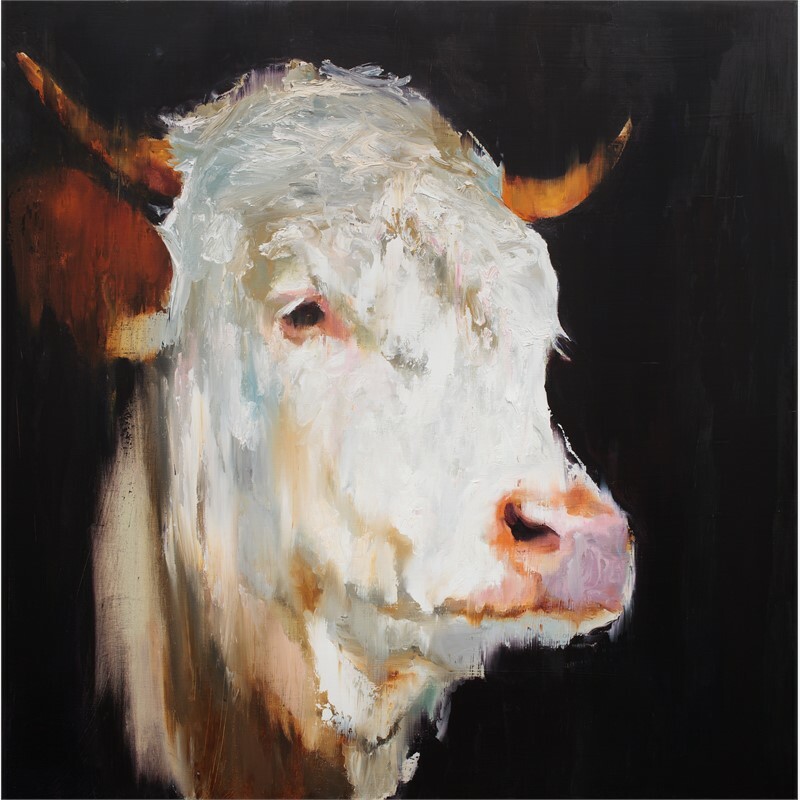 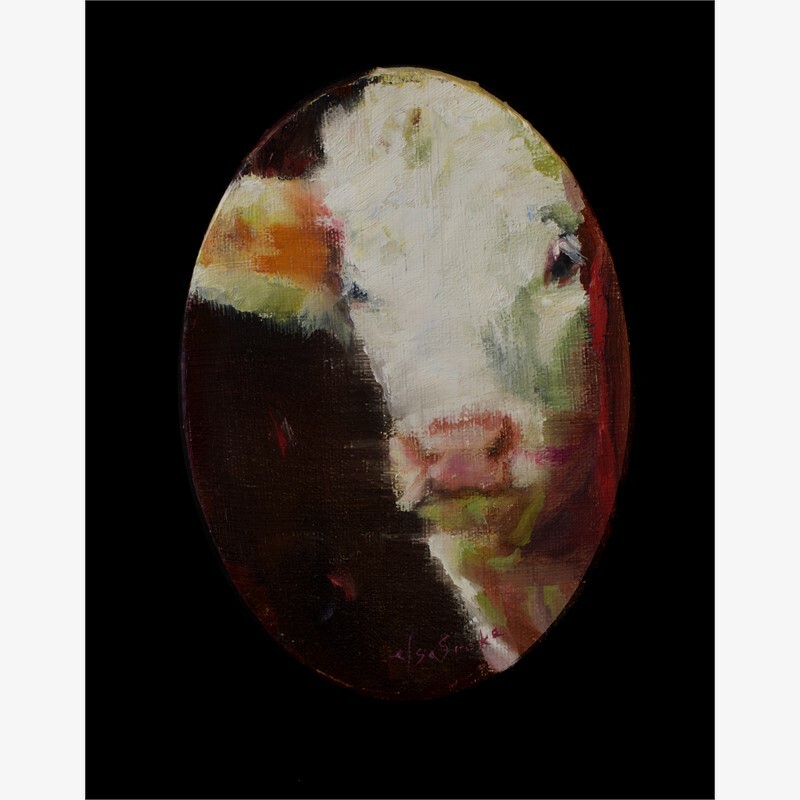 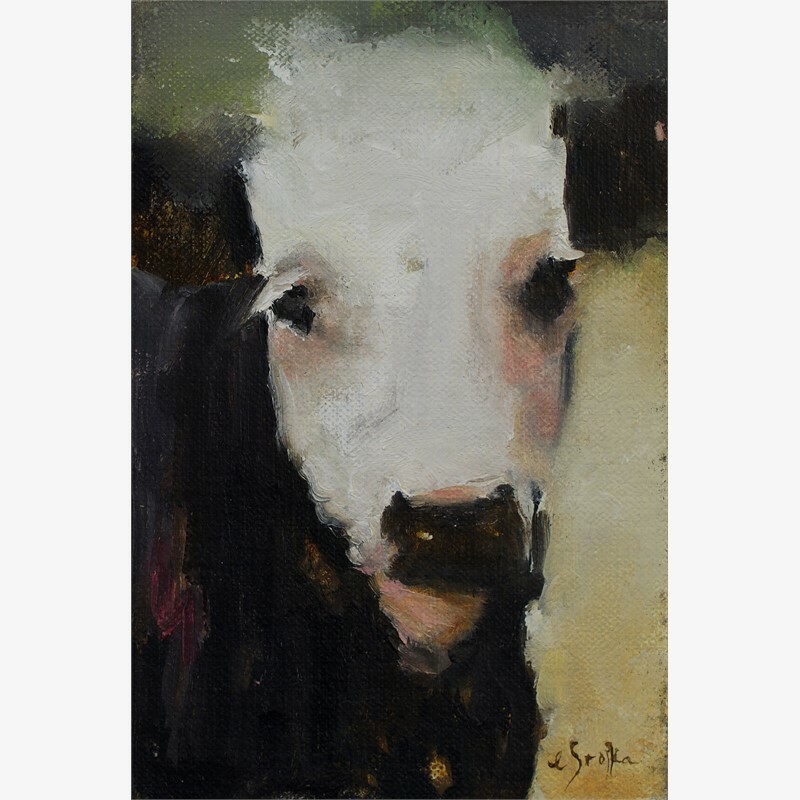 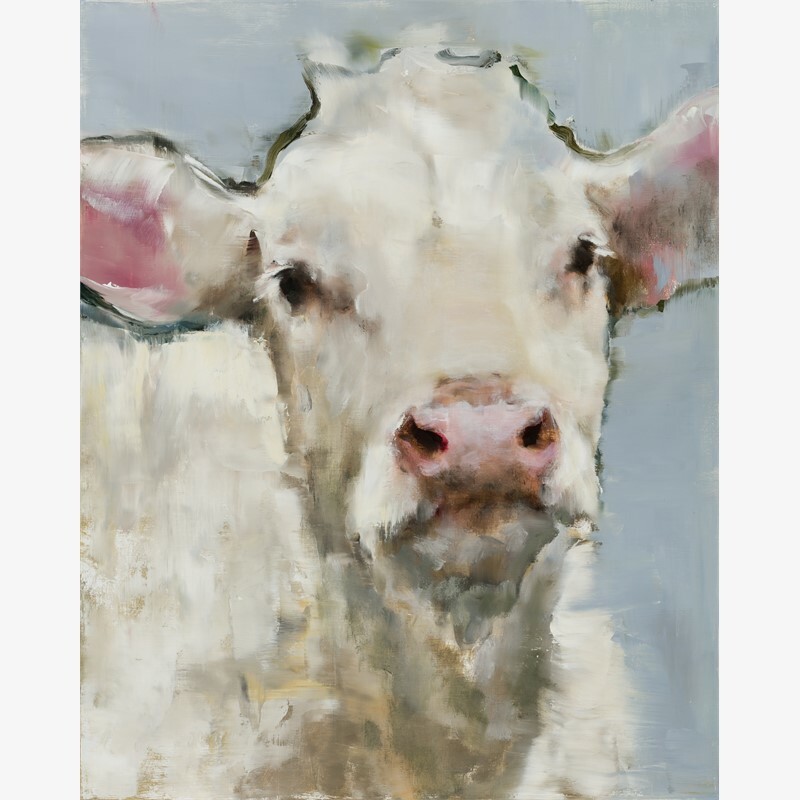 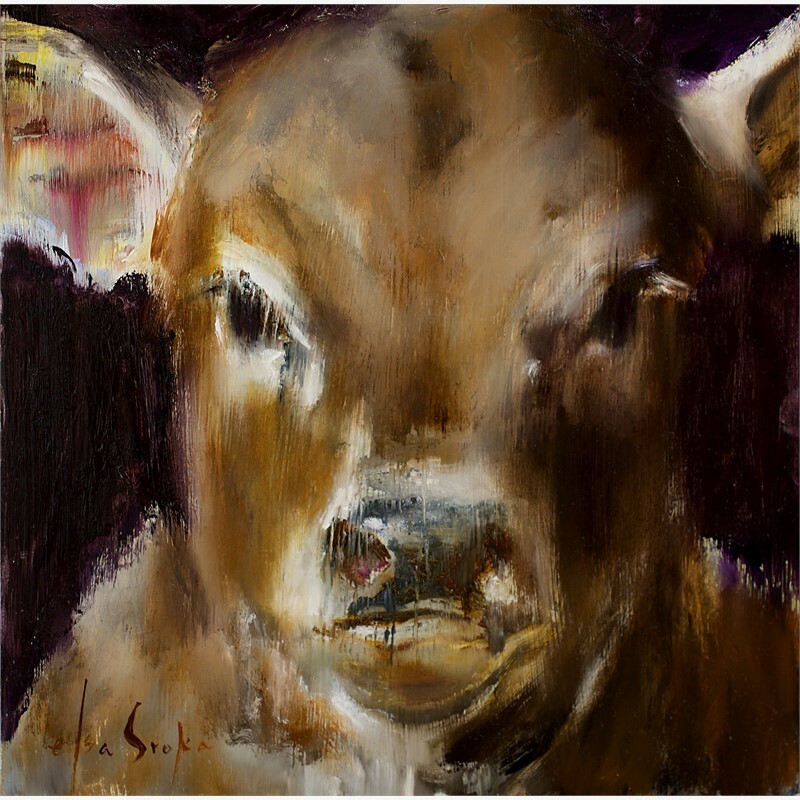 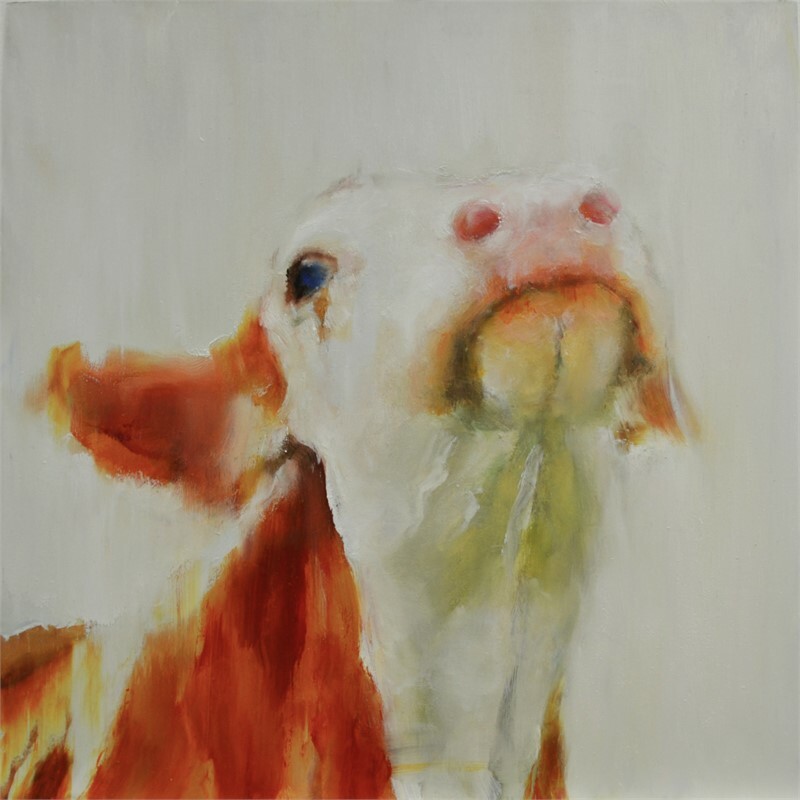 In Elsa’s cow series, expression is the most important element; infusing the subject with personality. 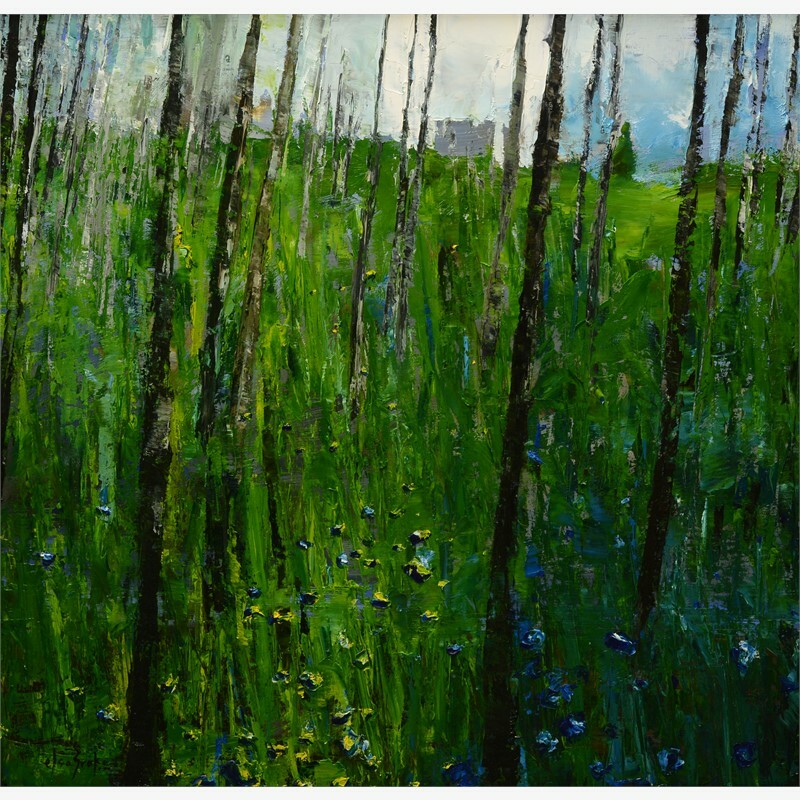 Emotional connection is necessary before painting can begin. 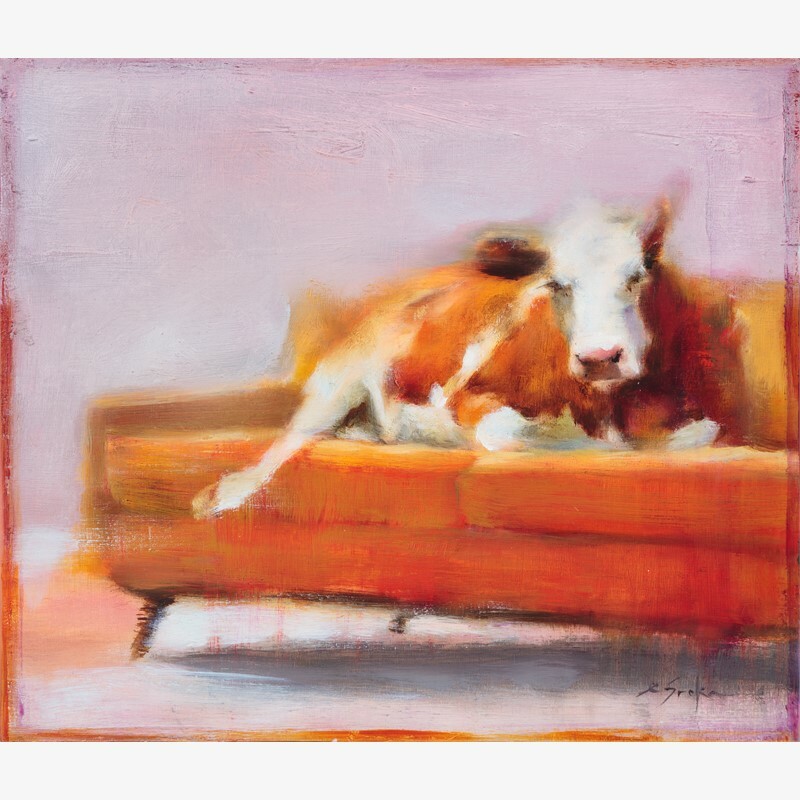 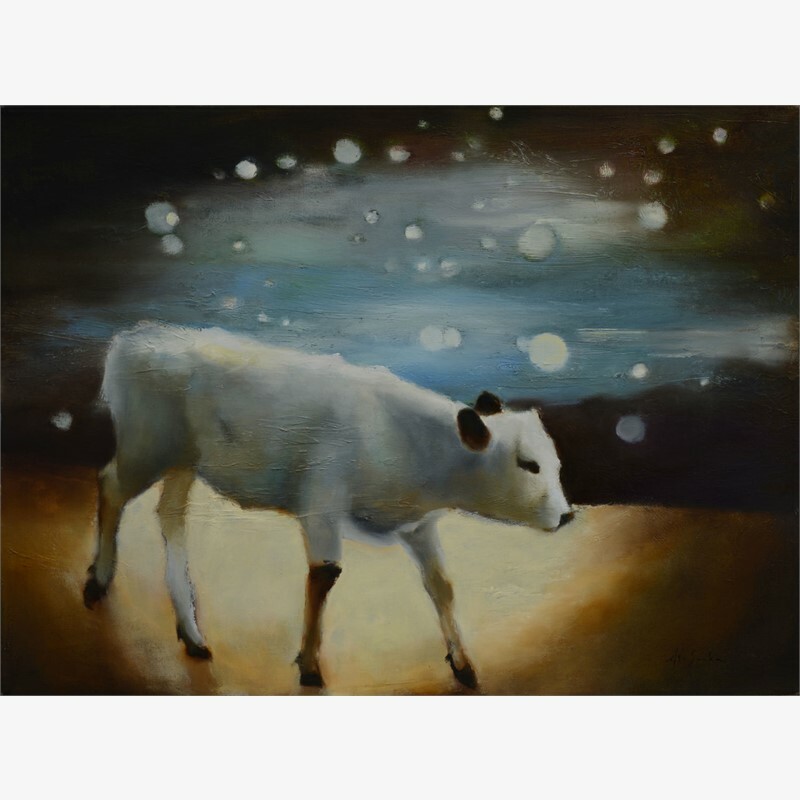 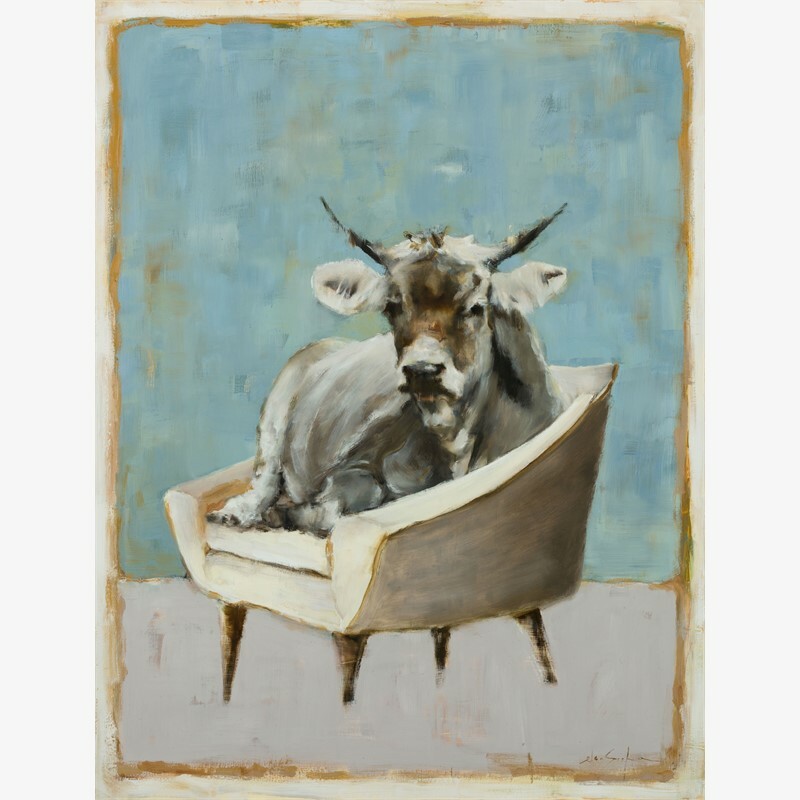 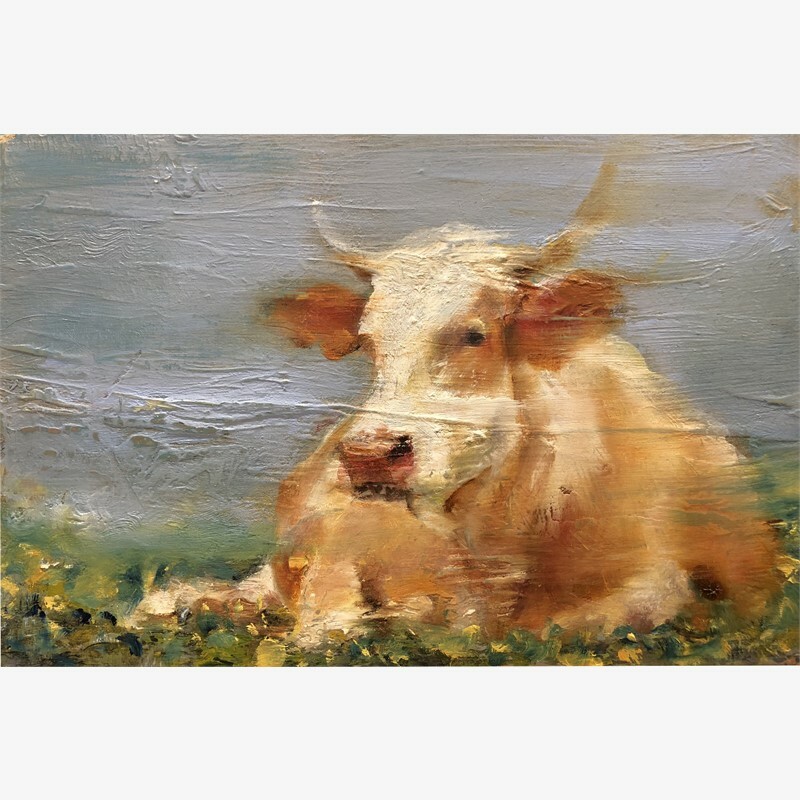 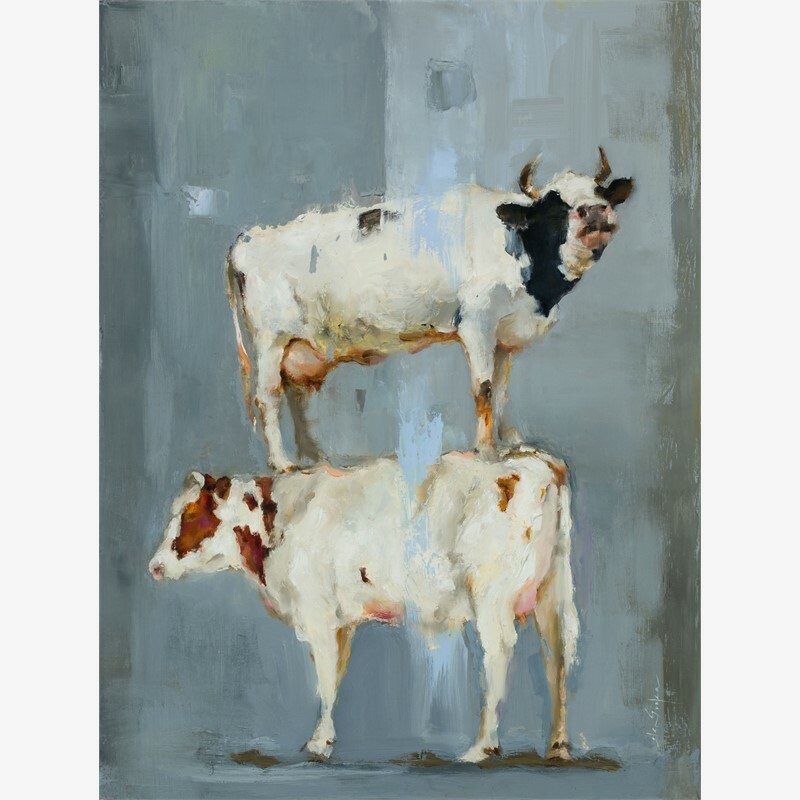 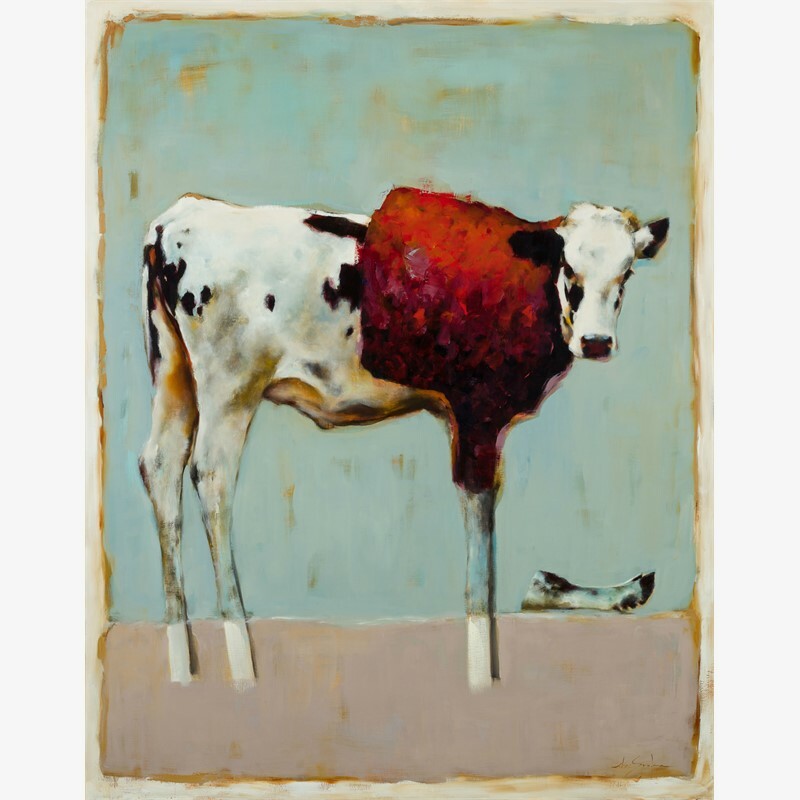 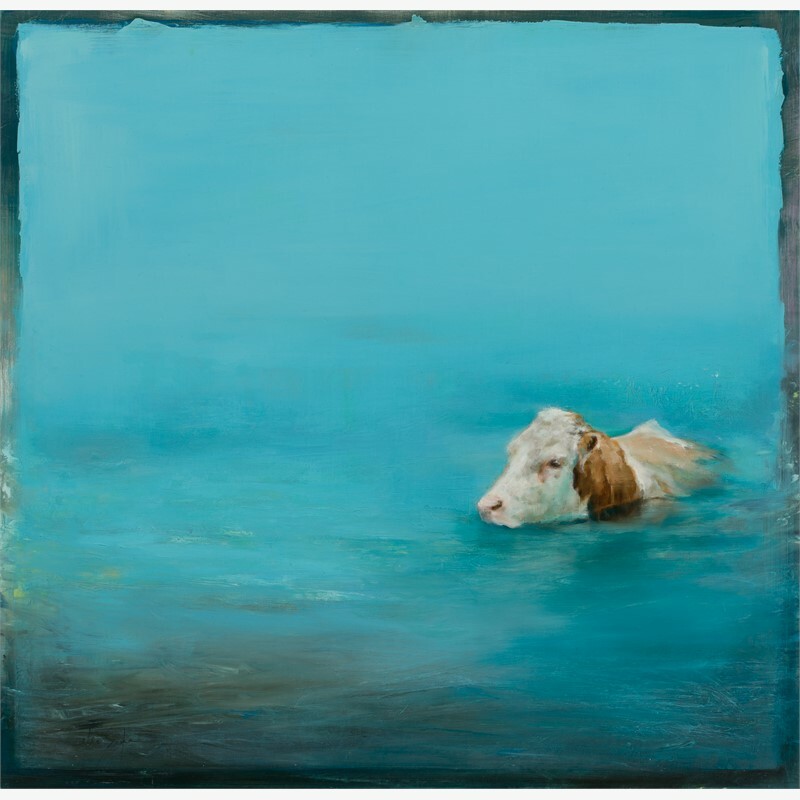 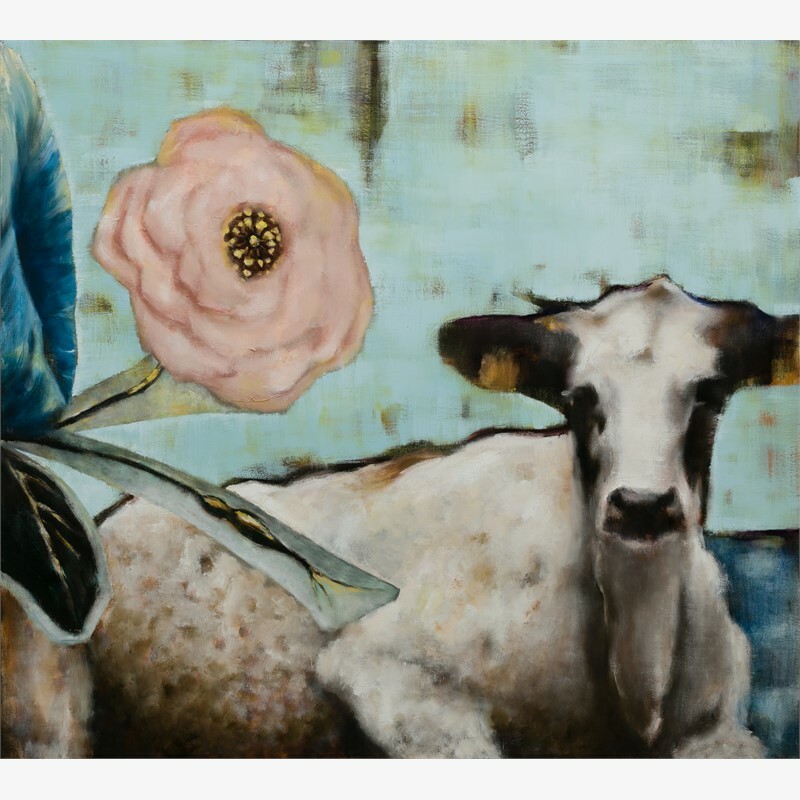 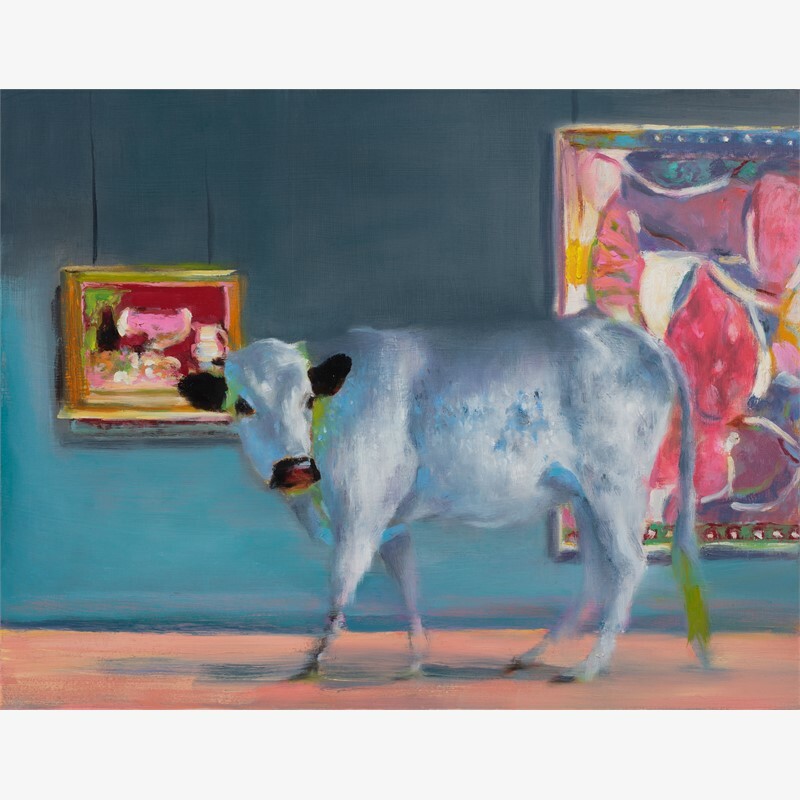 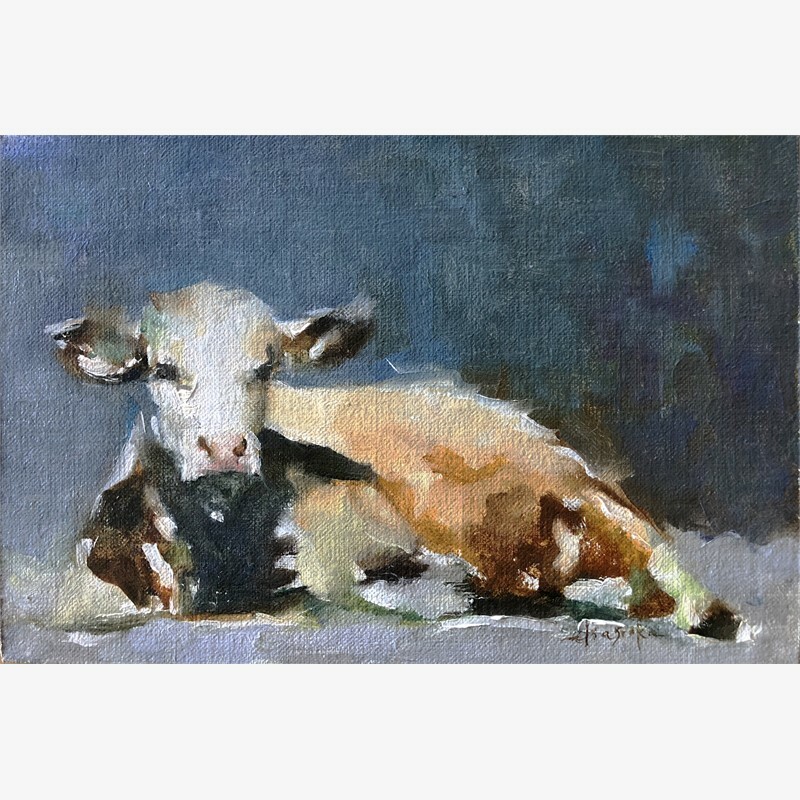 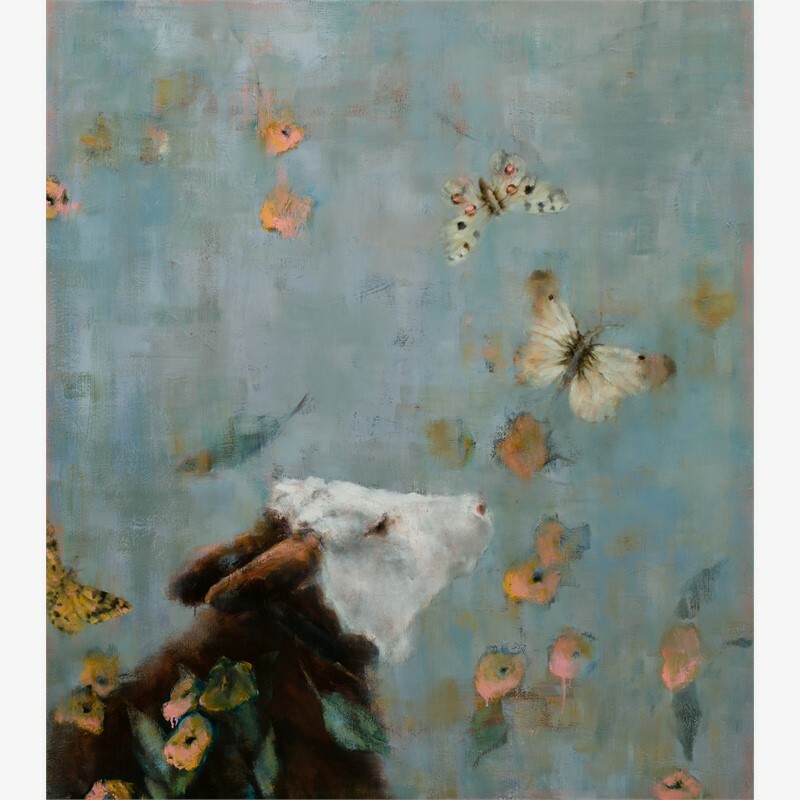 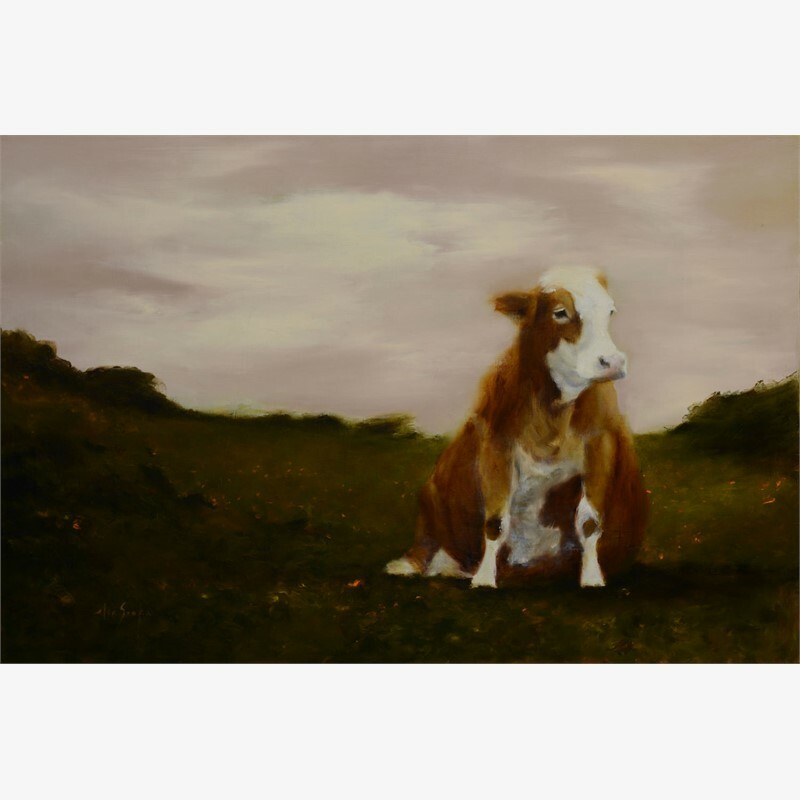 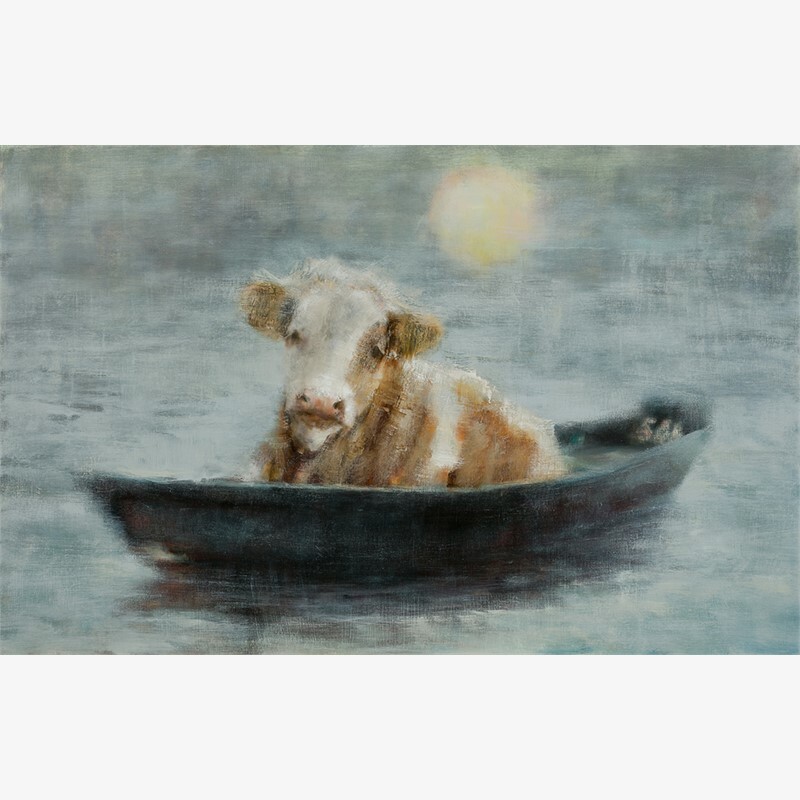 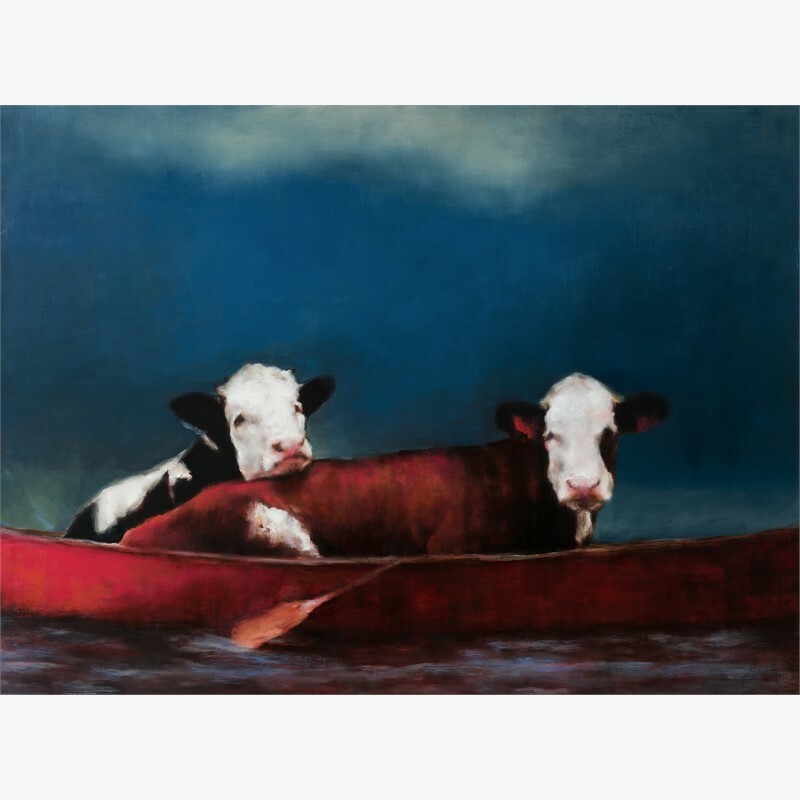 Recently she’s found inspiration in imagining cows in unconventional setting; a conscious departure from the traditional context found in much western art. 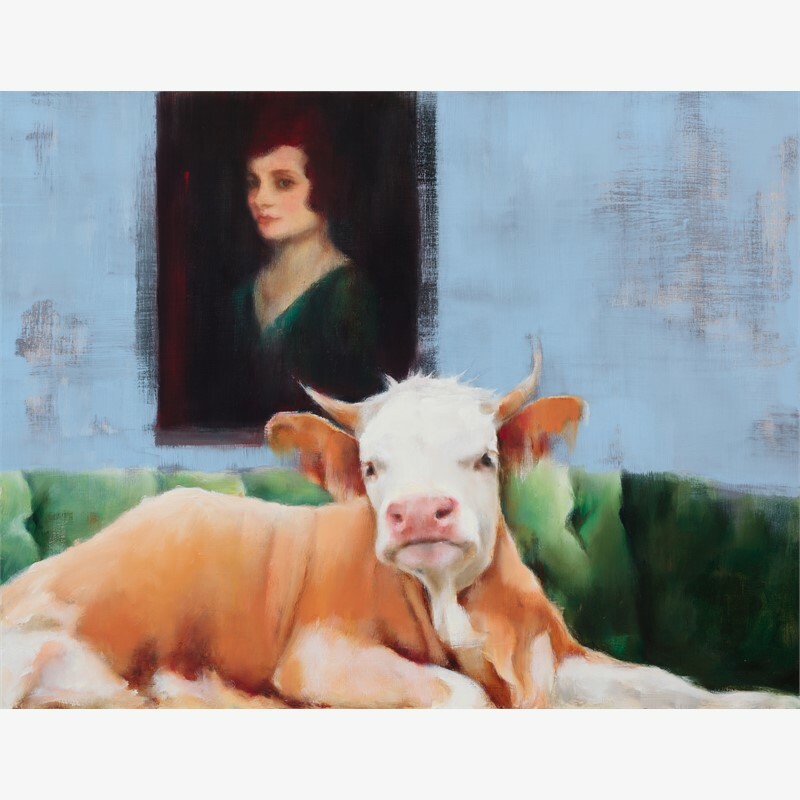 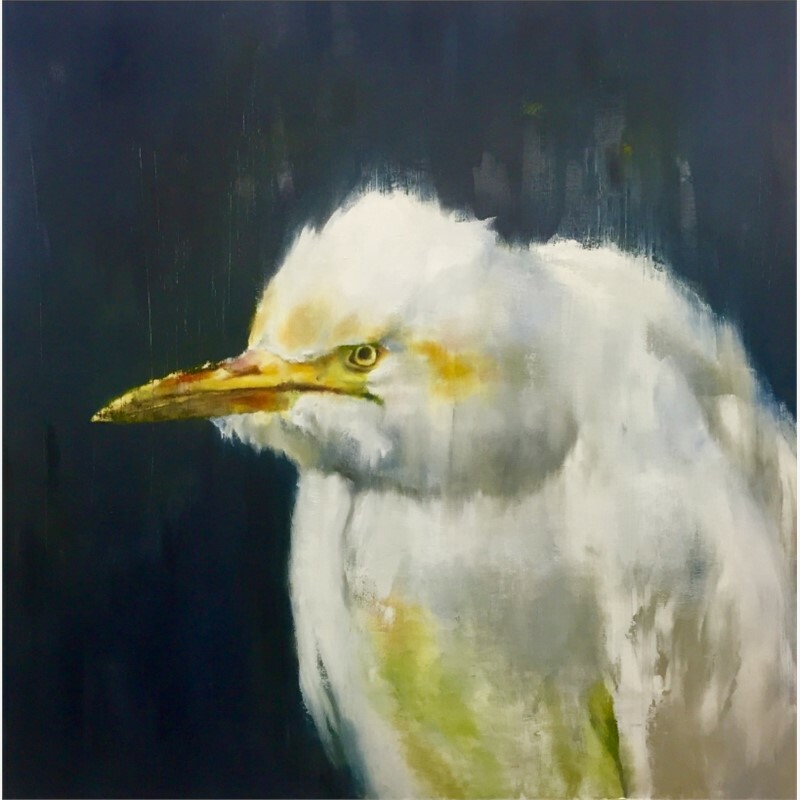 She believes the ordinary subject becomes significantly more intriguing when misplaced, inviting the viewer to pay attention through the element of surprise. 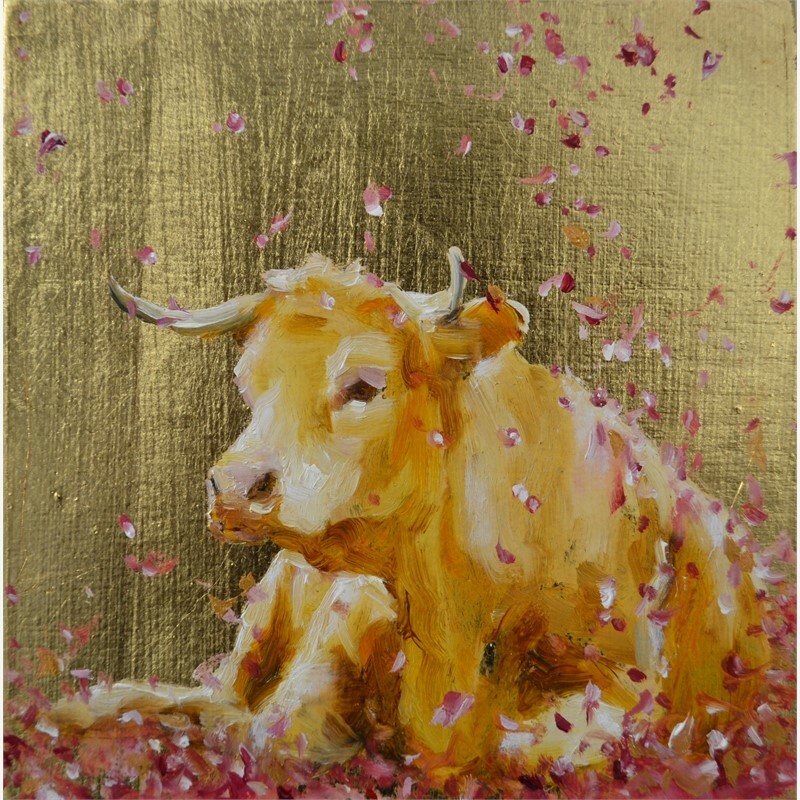 This idea can apply to many different subjects, encouraging appreciation of the more subtle qualities of beauty. 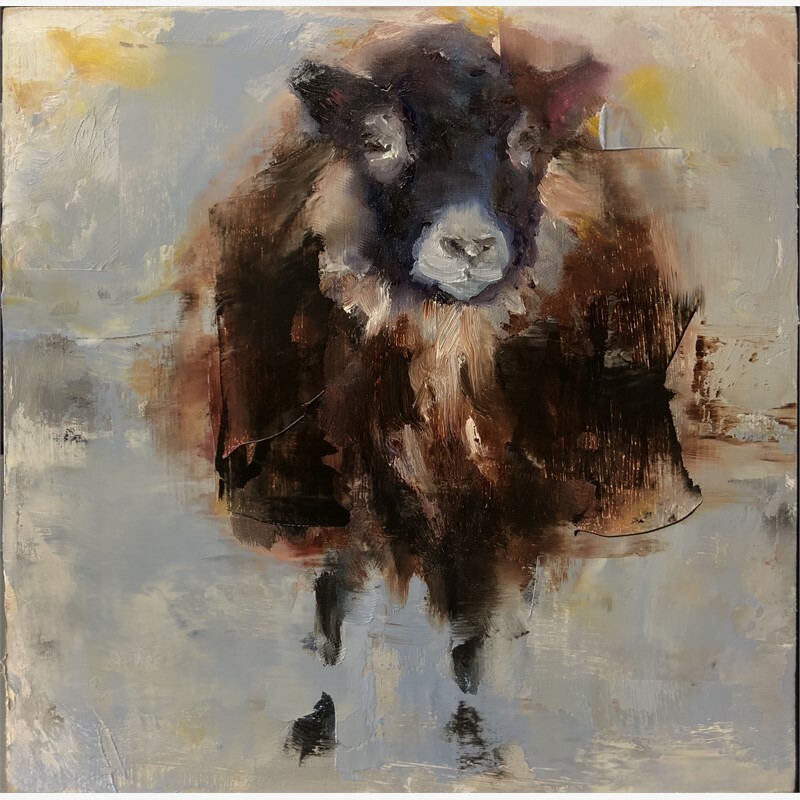 You’ll find her paintings share an intriguing play on genre and technique—many stylistically blurred, skewing reality, leaving the viewer to insert their own interpretation. 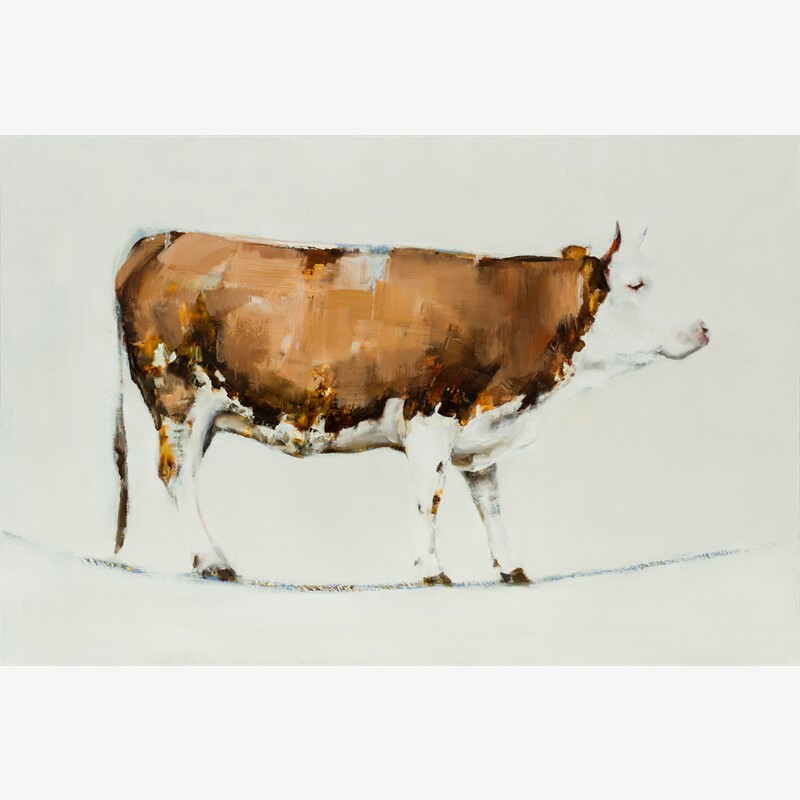 She is particularly interested in the interplay of different mediums, along with the challenge presented in manipulating traditional methods. 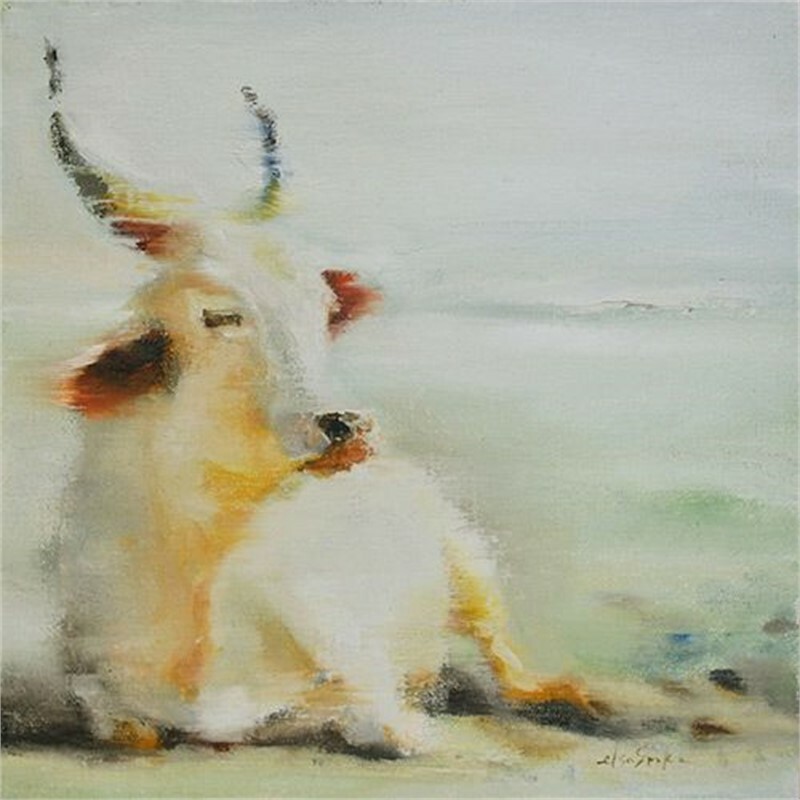 In the end, if Elsa is able to emotionally engage the viewer, she feels her work is complete. 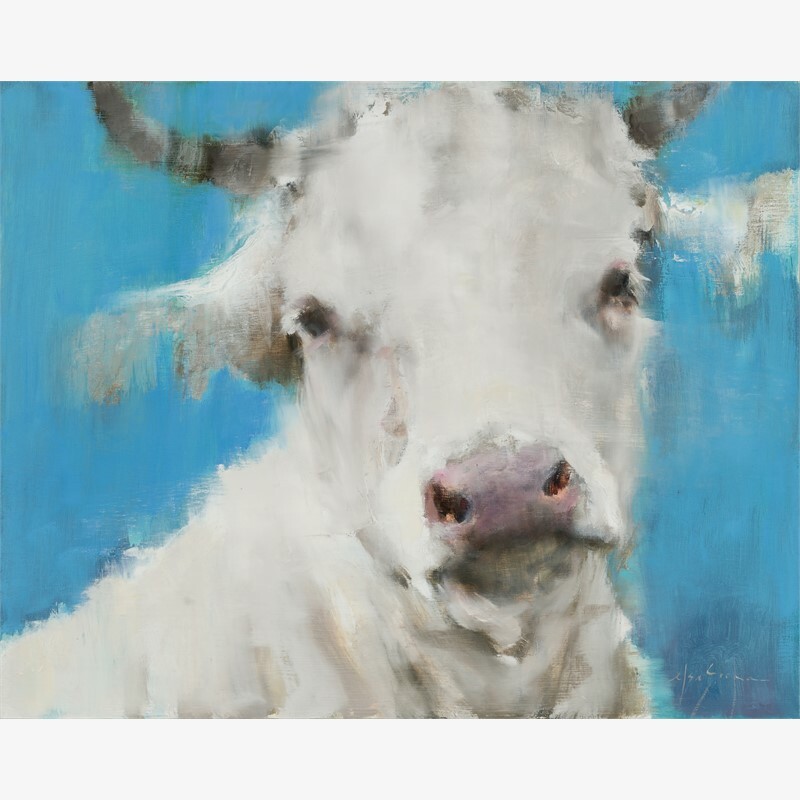 Elsa is a Colorado native from a family of six siblings, all of whom share the love of art and design. 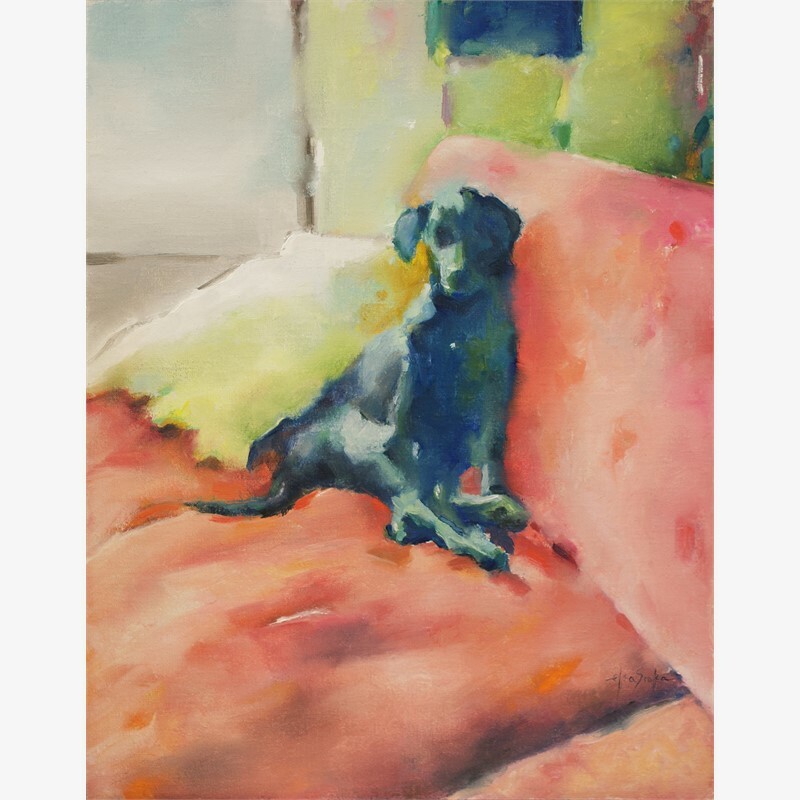 Mostly self taught, Elsa’s work is based on instinct rather than theory. 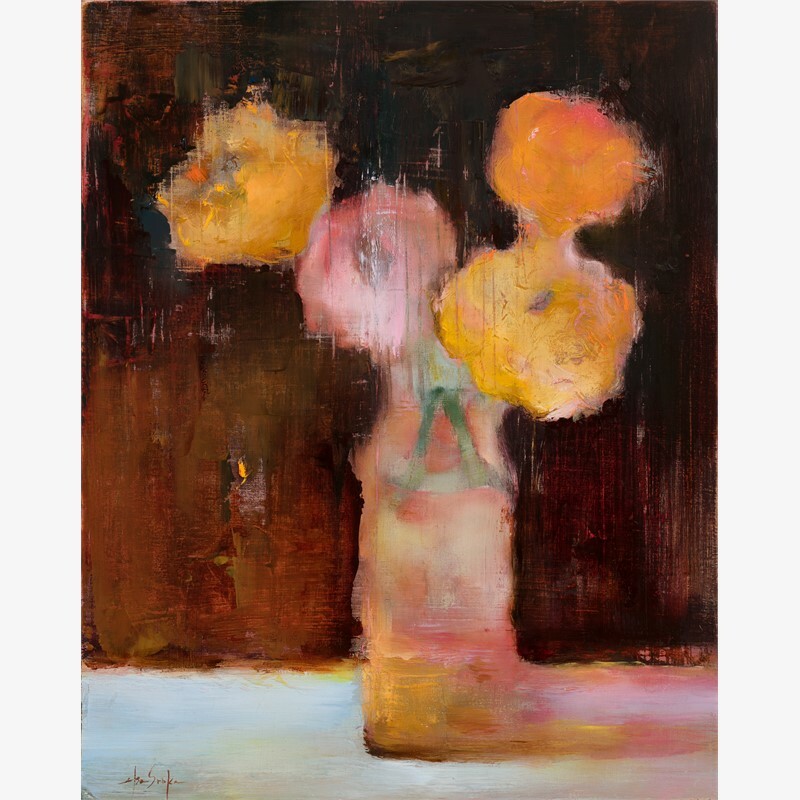 Her inspiration can be selective as when drawn from early childhood memories; particularly hours spent drawing at the kitchen table with her brothers and sisters overseen by their father. 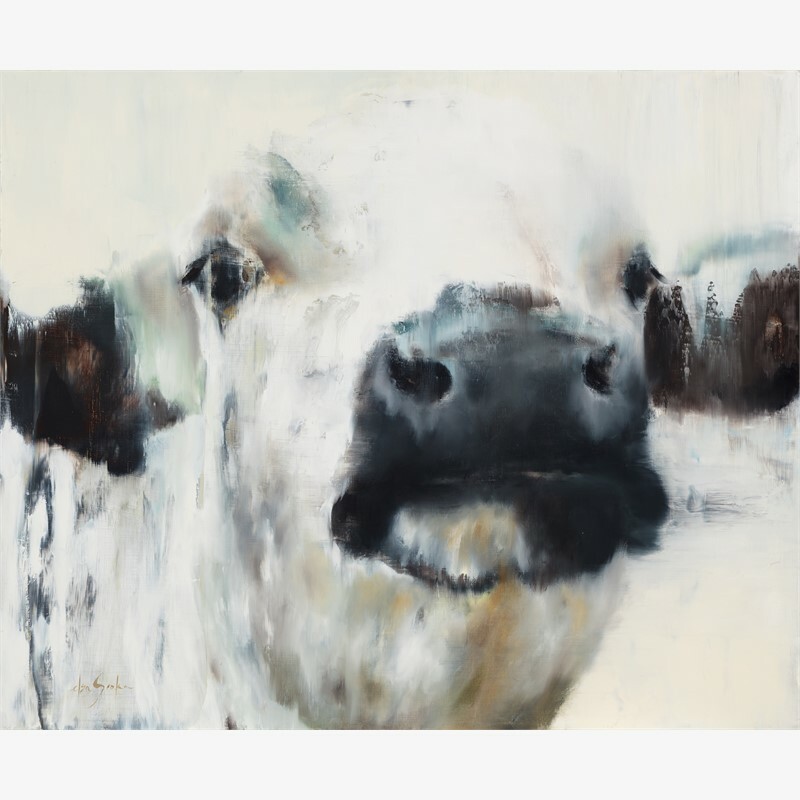 Her inspiration can also randomly unfold as she approaches a blank canvas with no preconceived ideas, not knowing where it will end up. 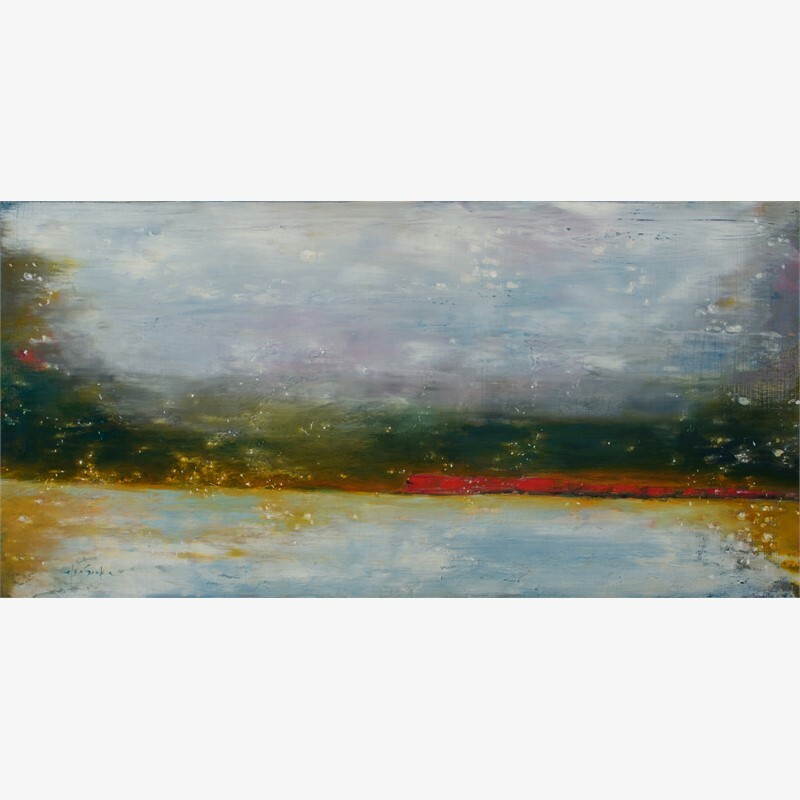 Often the subjects of her paintings are secondary to what may emerge from both unintentional marks and intentional smears that ignite a series of chain reactions suggesting a direction and ultimately meaning. 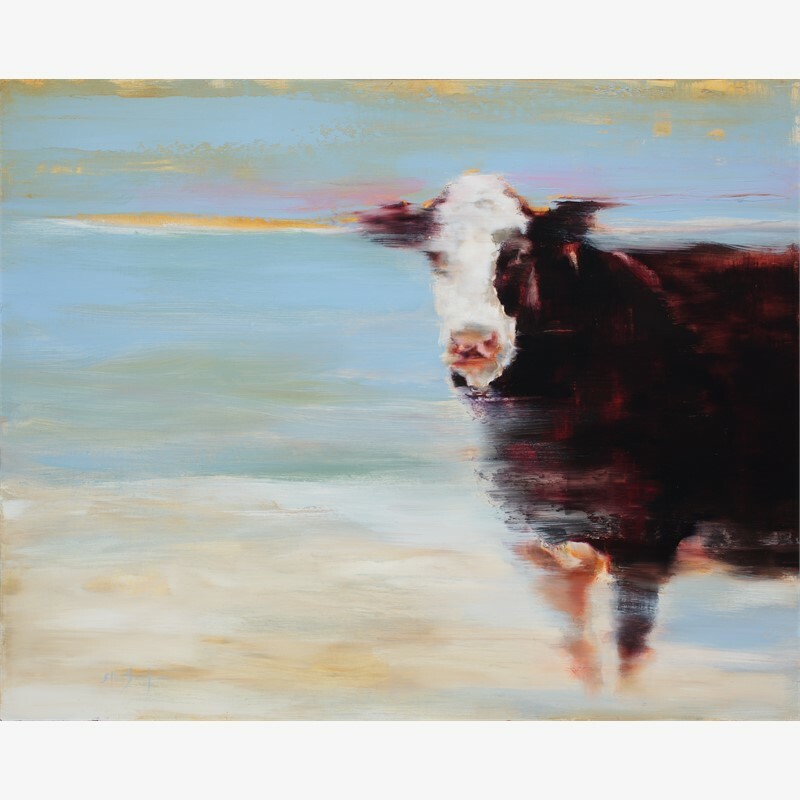 While Elsa paints a variety of subjects, all exude a forward-thinking, contemporary attitude. 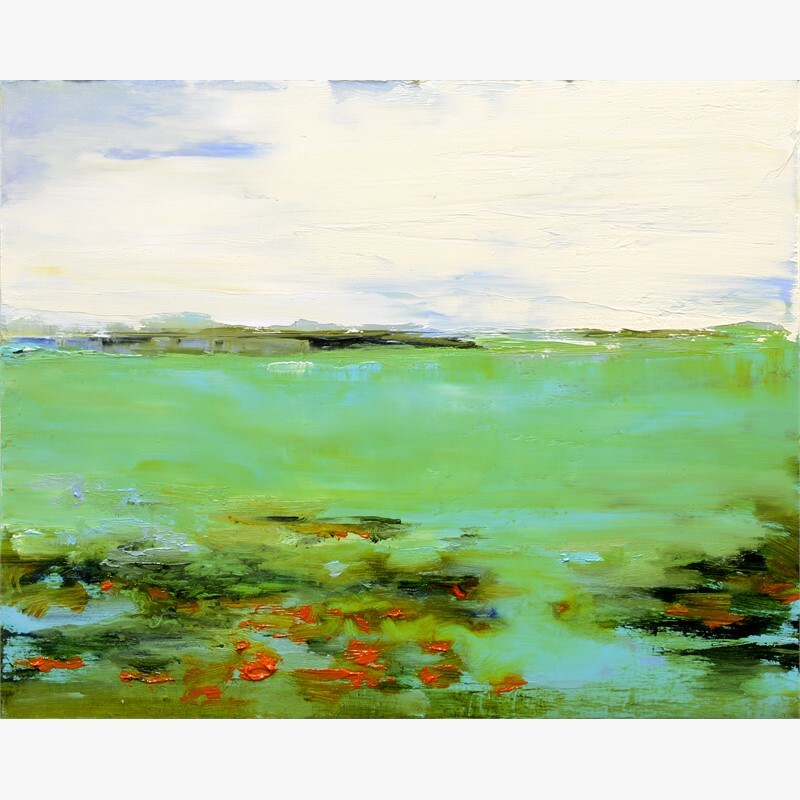 Her landscapes are mostly color-driven, finding inspiration in many sources including the various landscapes discovered in her travels, elements found in architecture, the imagery of other artists, and her own imagination. 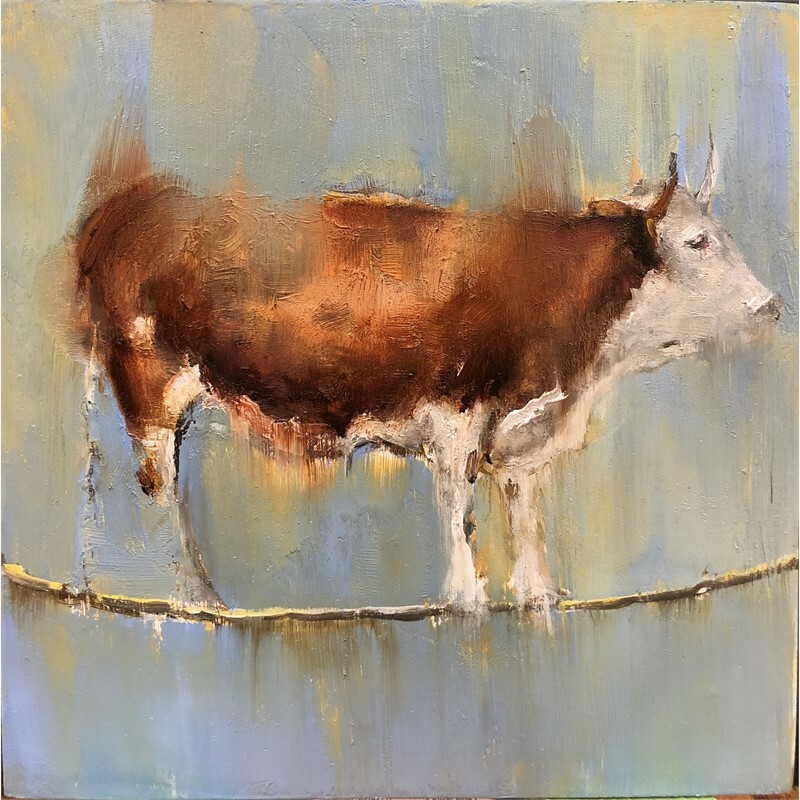 After laying down her foundational colors she scrapes away and moves the paint to reveal what is underneath, then applies more layers of paint. 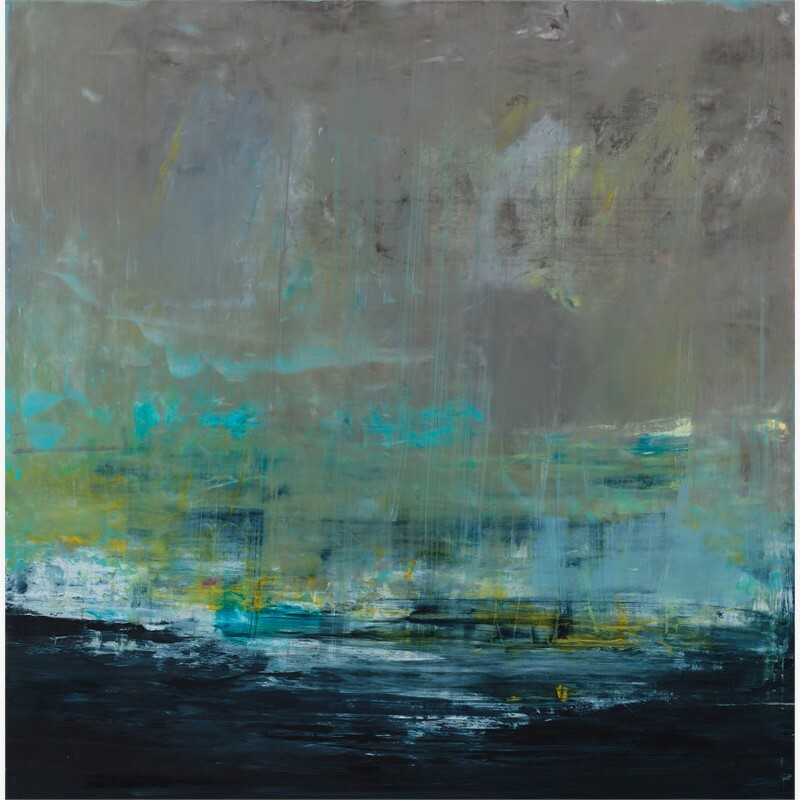 It’s not unusual for her to destroy a large portion of the piece in progress, ultimately resurrecting it through layer after layer, creating meaning and form in the process. 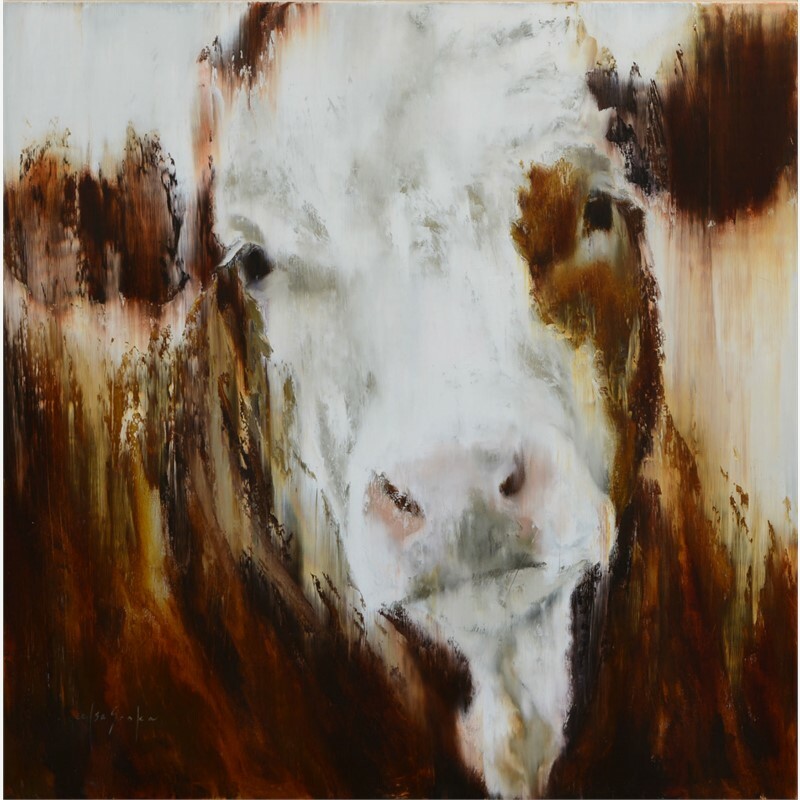 In Elsa’s cow series, expression is the most important element; infusing the subject with personality. 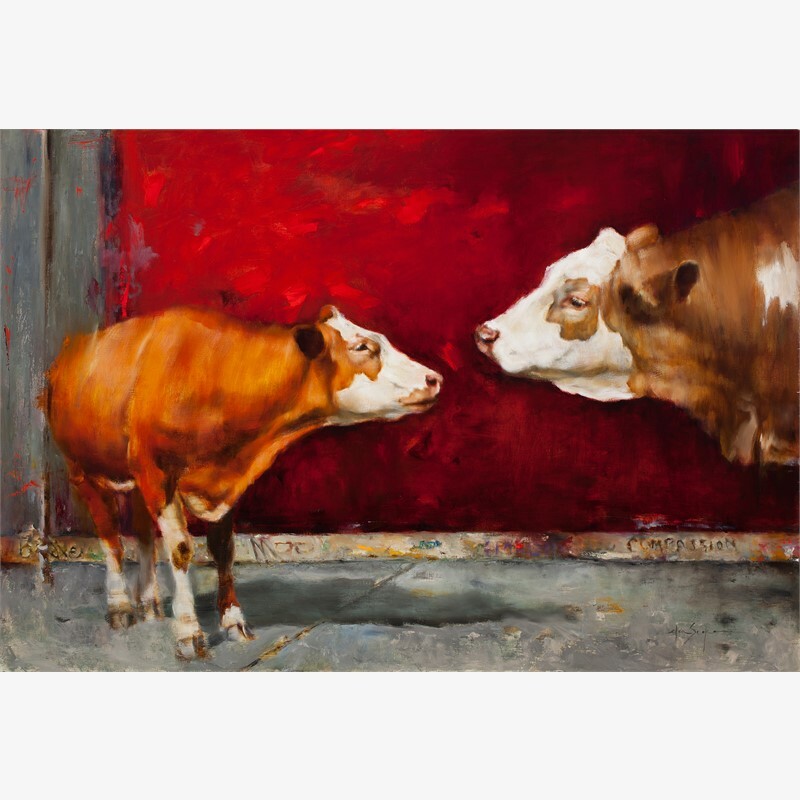 Emotional connection is necessary before painting can begin. 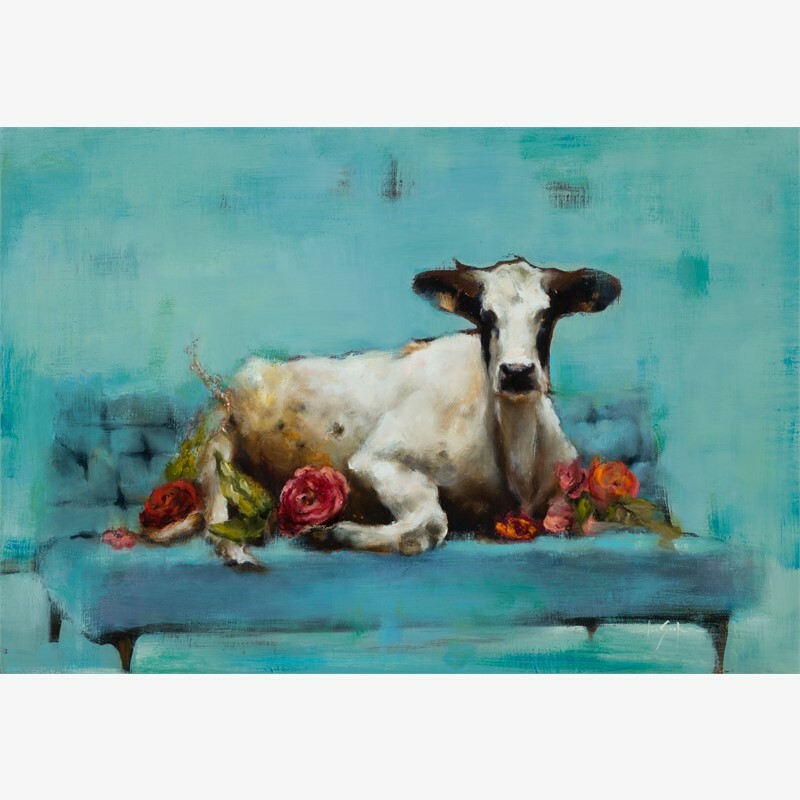 Recently she’s found inspiration in imagining cows in unconventional setting; a conscious departure from the traditional context found in much western art. 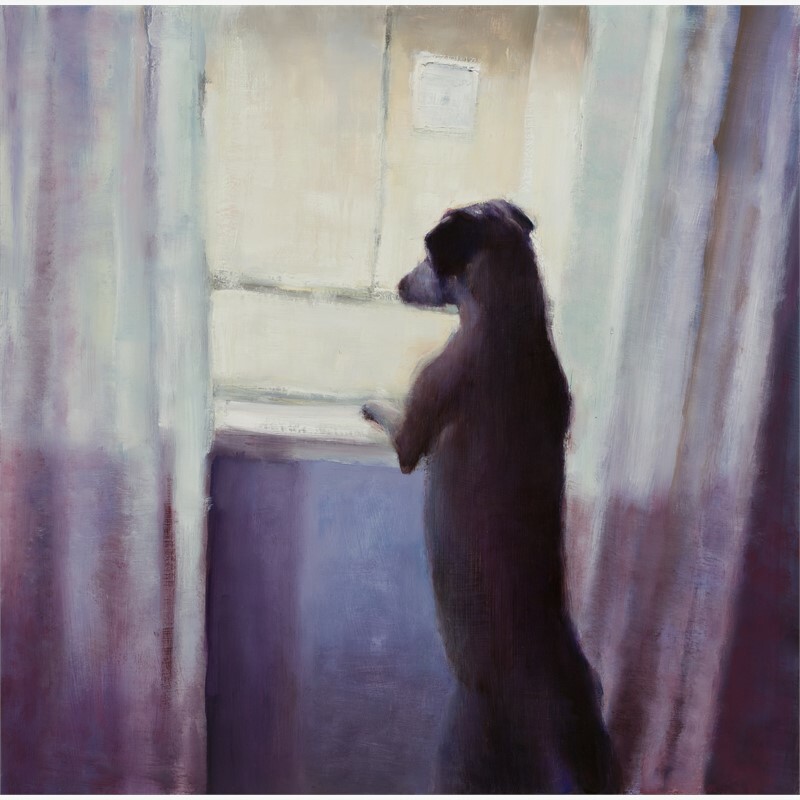 She believes the ordinary subject becomes significantly more intriguing when misplaced, inviting the viewer to pay attention through the element of surprise. 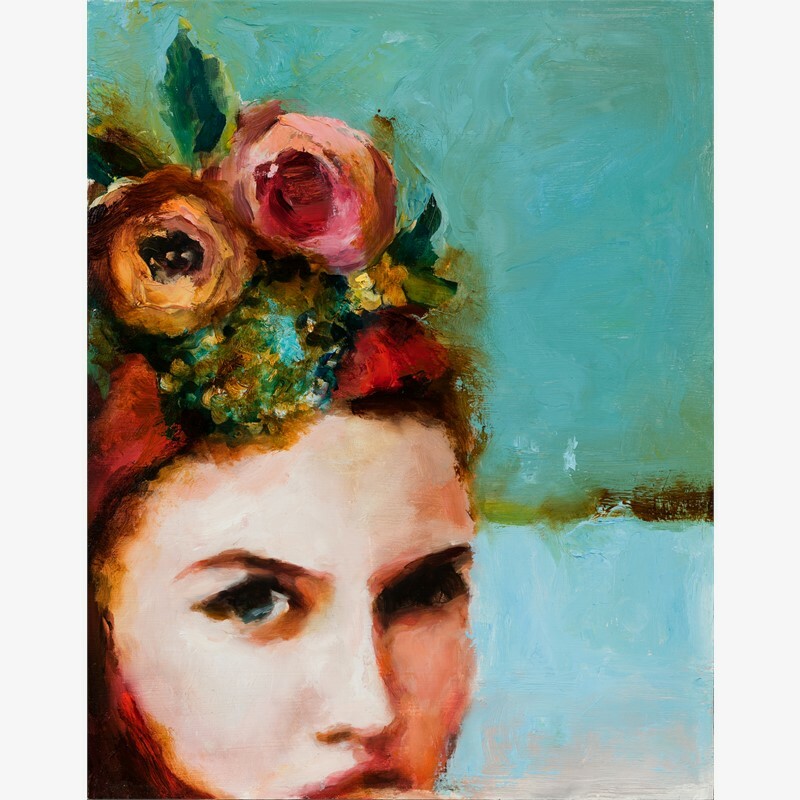 This idea can apply to many different subjects, encouraging appreciation of the more subtle qualities of beauty. 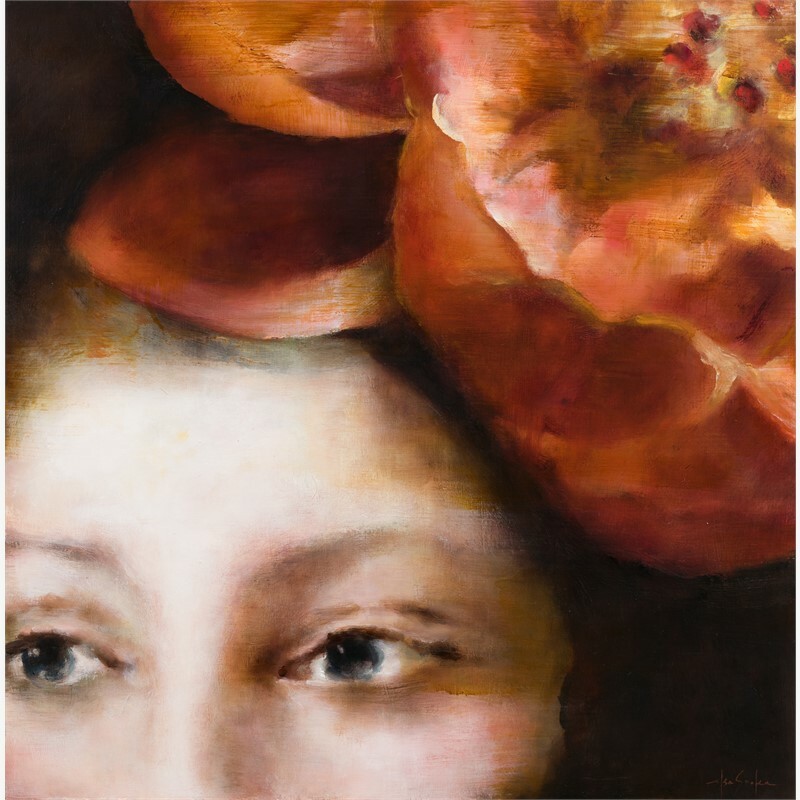 You’ll find her paintings share an intriguing play on genre and technique—many stylistically blurred, skewing reality, leaving the viewer to insert their own interpretation. 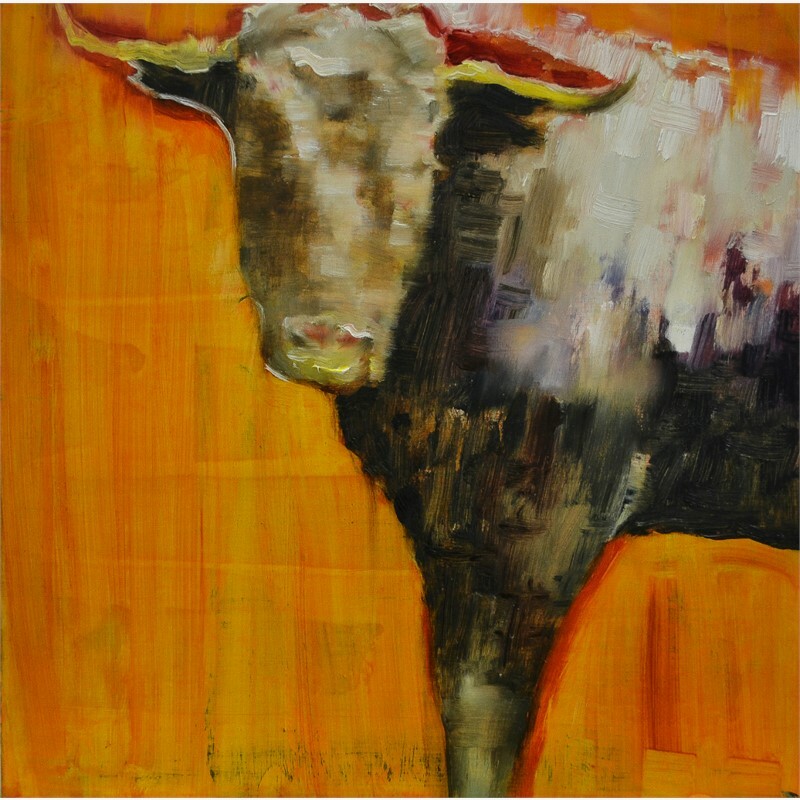 She is particularly interested in the interplay of different mediums, along with the challenge presented in manipulating traditional methods. 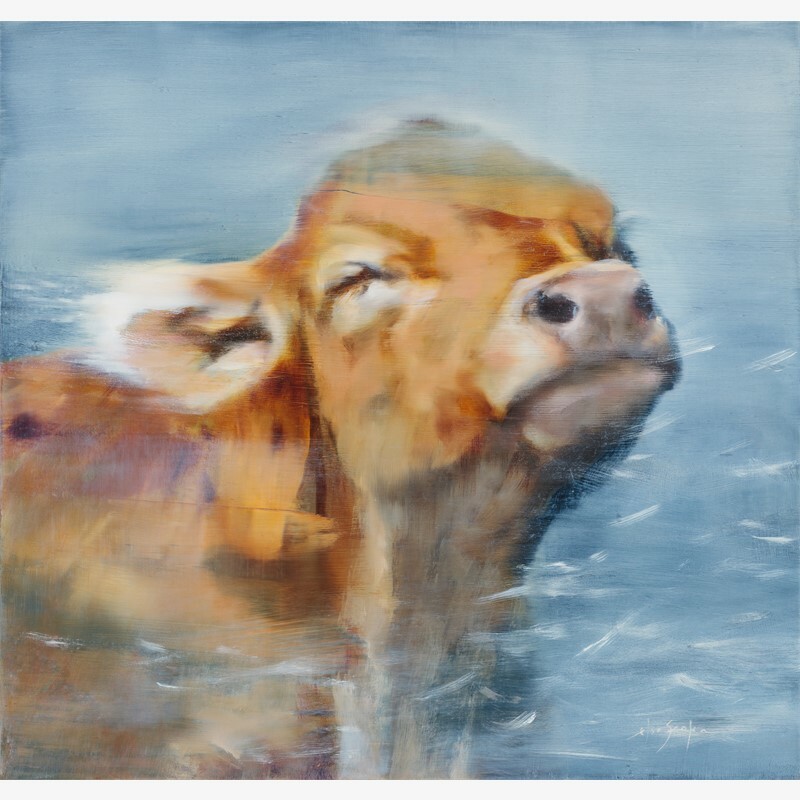 In the end, if Elsa is able to emotionally engage the viewer, she feels her work is complete.